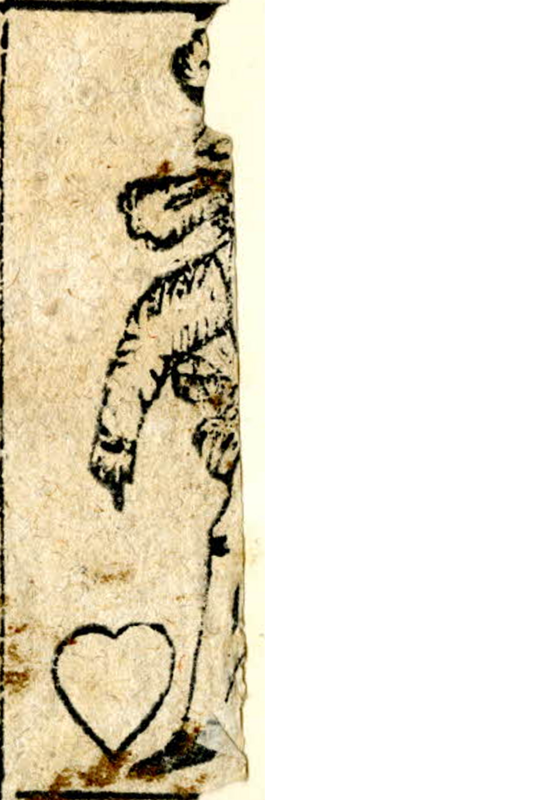 The pip cards in general have no vignette illustrations below the suit signs. 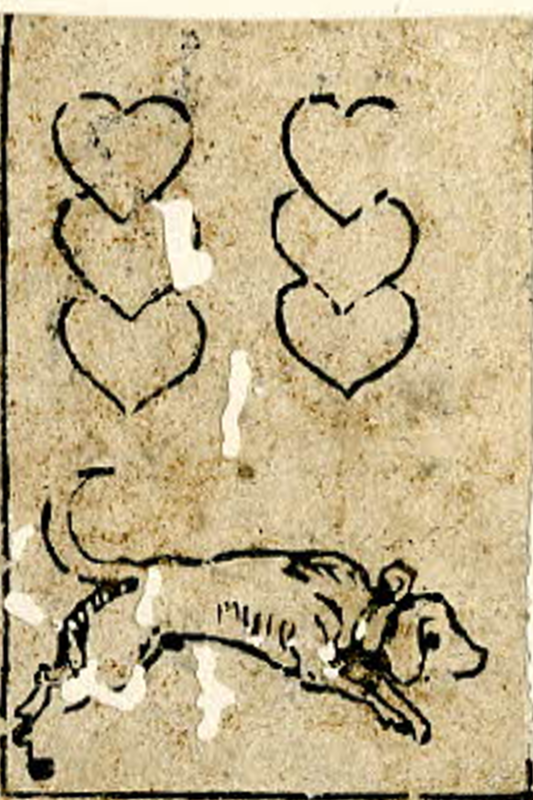 All three surviving deuces (and thus presumably also the lost one) have a sow as vignette illustration. 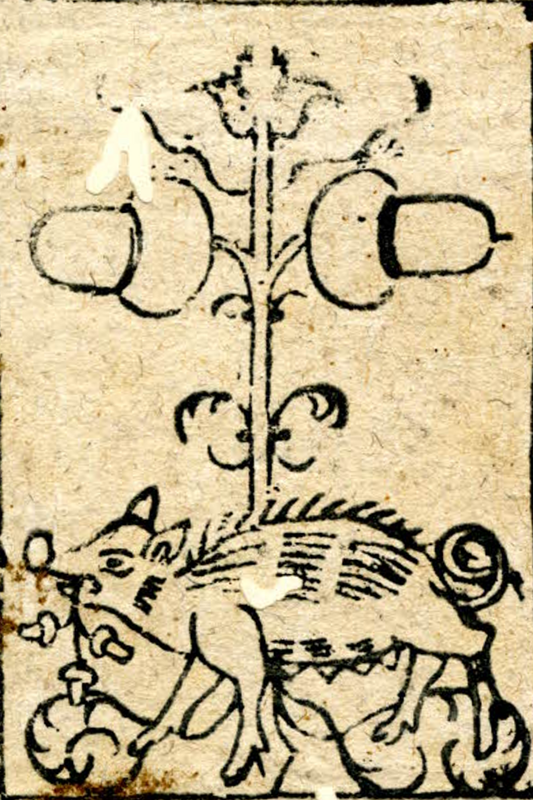 Several patterns have sows on one, more or all deuces. 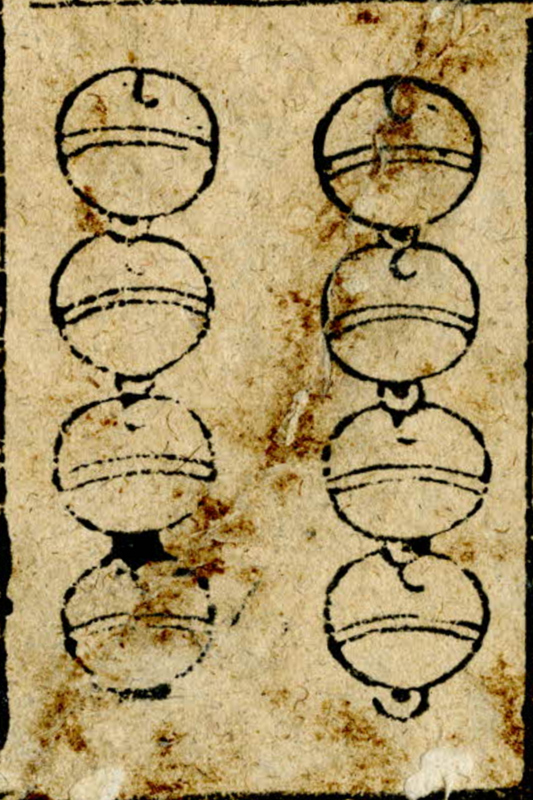 The tens are banner tens. 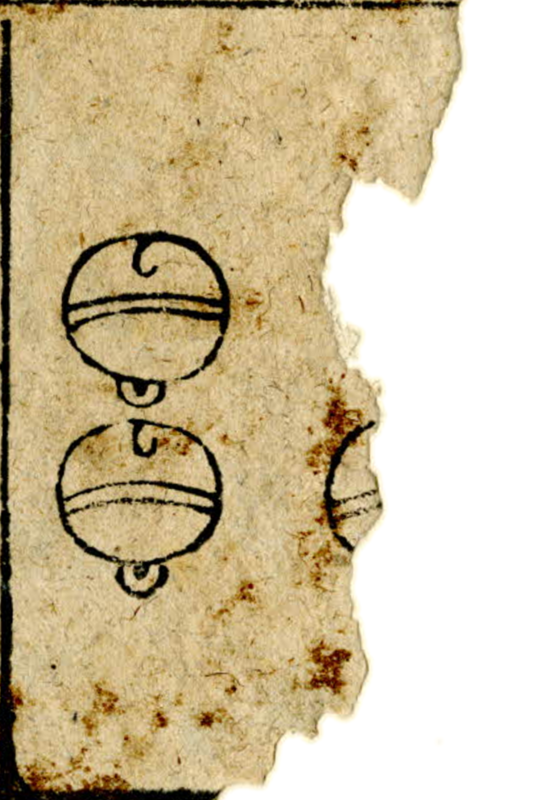 They lack the letter X frequently present on both banner and pip tens. 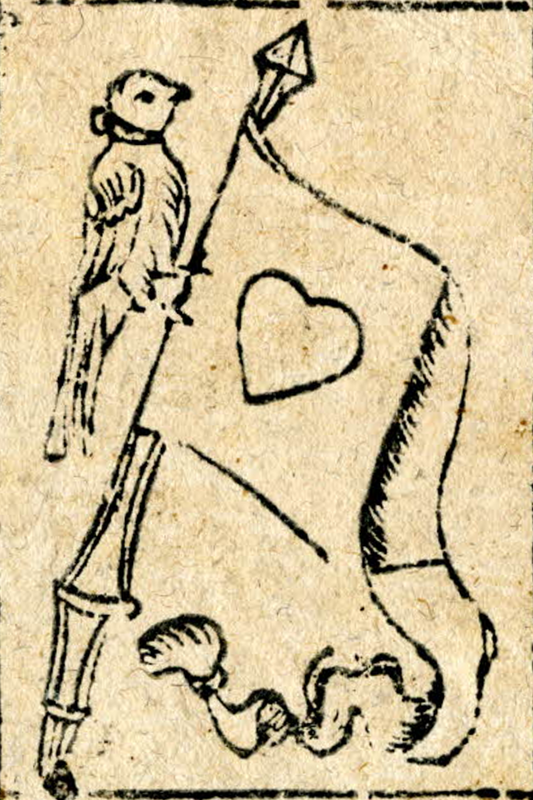 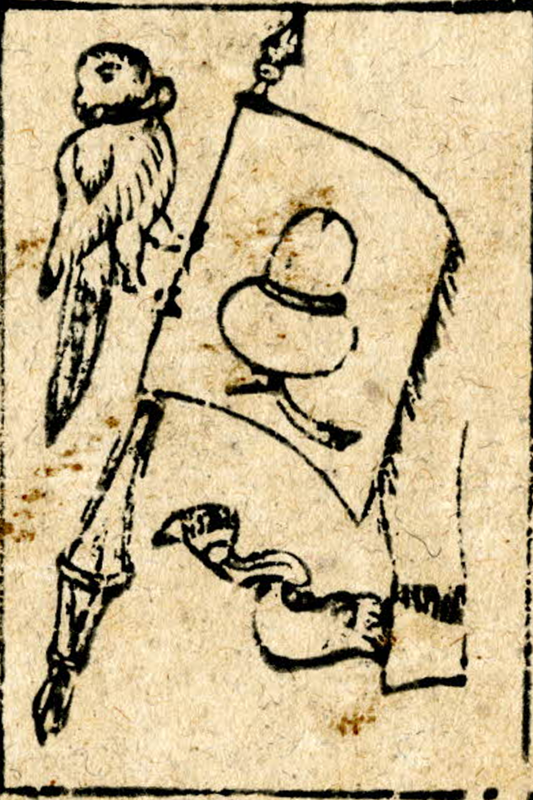 On the three intact cards, a bird is perched on the banner; the fourth card has presumably also had this feature. 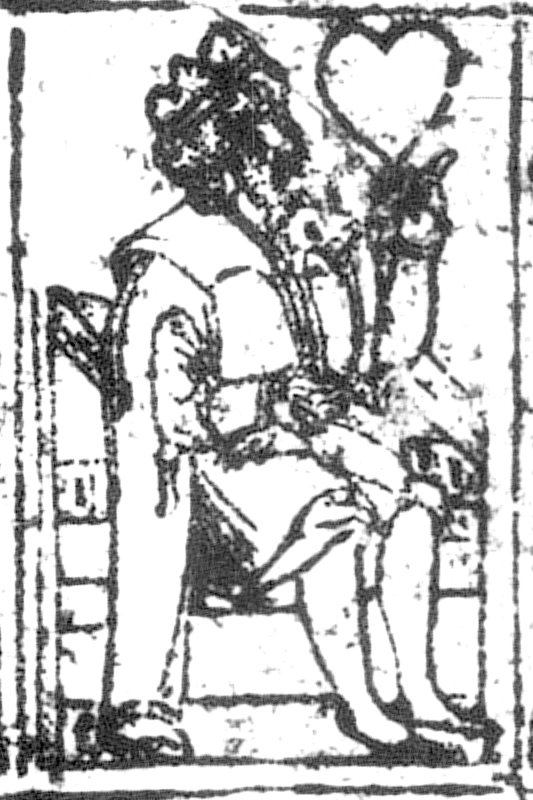 The kings are seated on thrones. 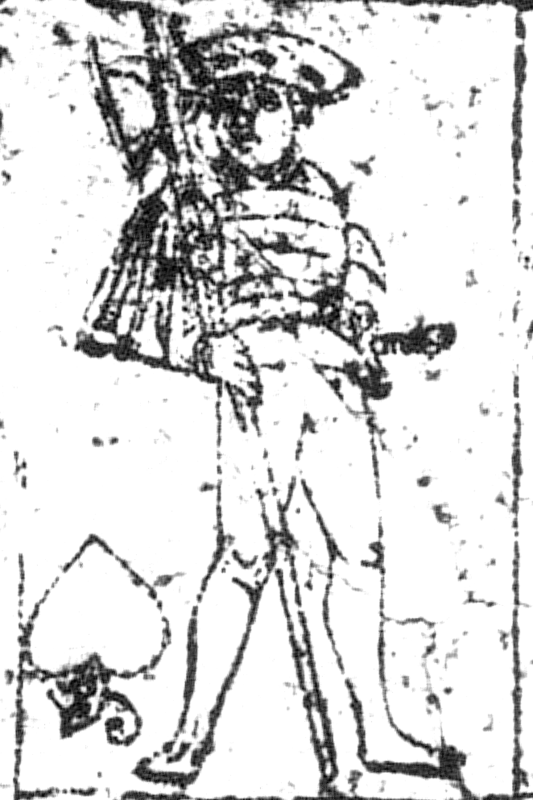 This is very common, as is also kings on horseback; while standing kings is a less frequent third alternative. 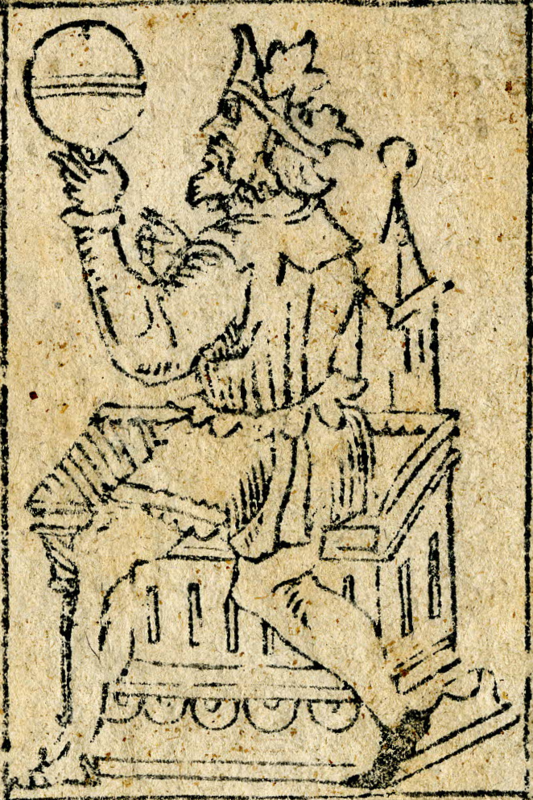 The 48 card structure of the German non-luxury decks had developed from an earlier common ancestor with luxury decks, which also contained aces. 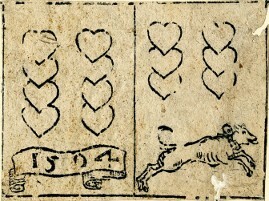 The loss of the aces was prompted by the ease of printing the reduced deck from two woodblocks, each containing a grid of six by four cards. 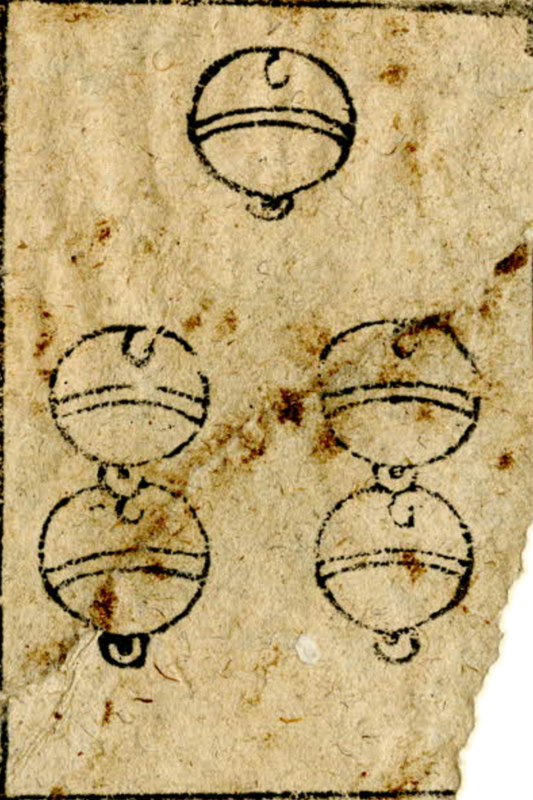 Keeping a thirteenth subject in each suit meant making a third block merely for these – the same concern led to the abandonment of tens in Spanish and Portuguese cards. 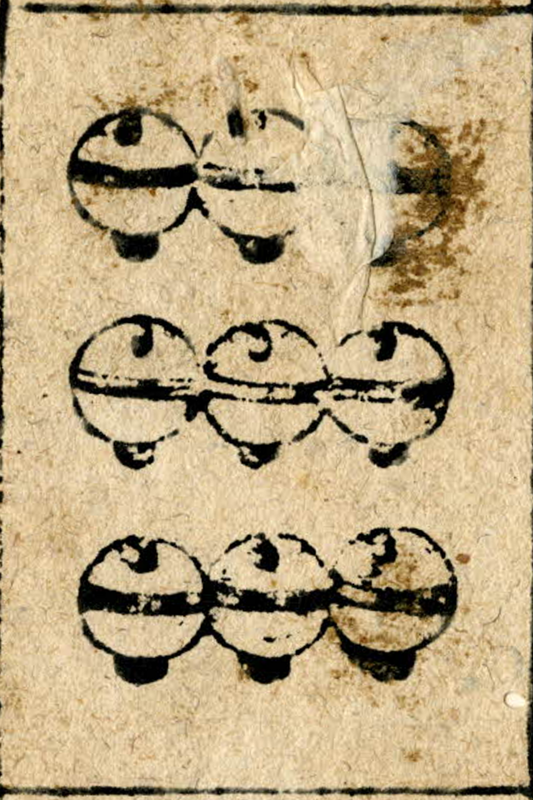 A group of Italian decks is preserved, where the tens were printed from a separate block; possibly the manufacturer was supplying both areas retaining 52 cards and ones where 48 card decks had replaced these. 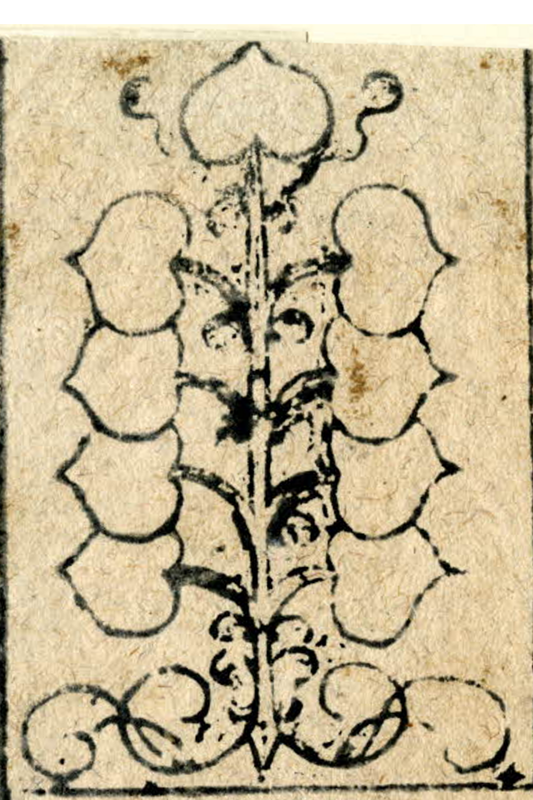 It is therefore surprising to find that this deck was printed from two slightly irregular woodblocks with only 22 cards each plus a separate block with the remaining four cards. 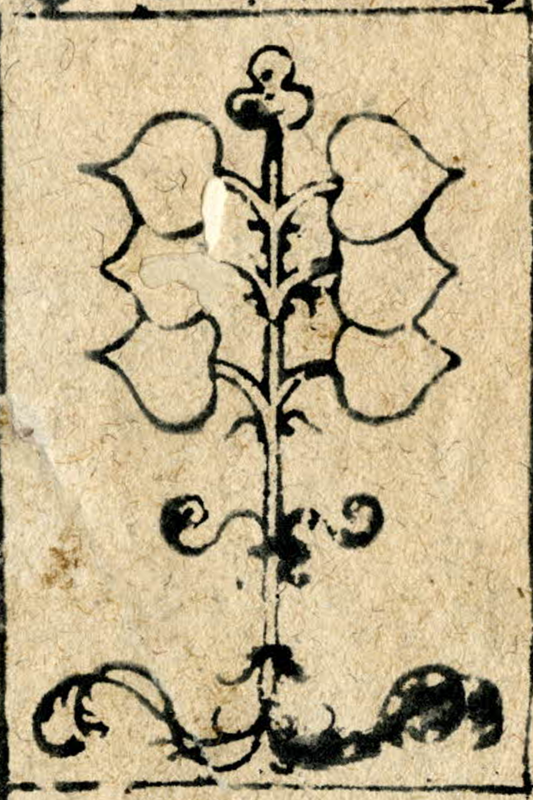 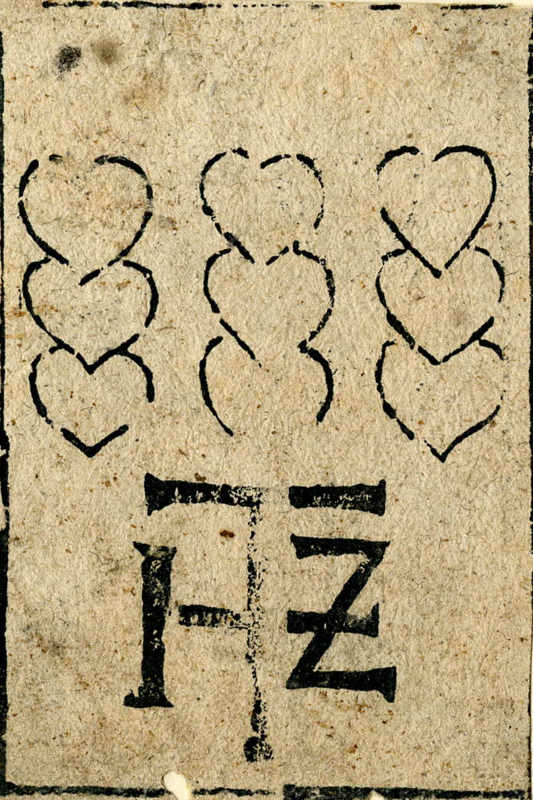 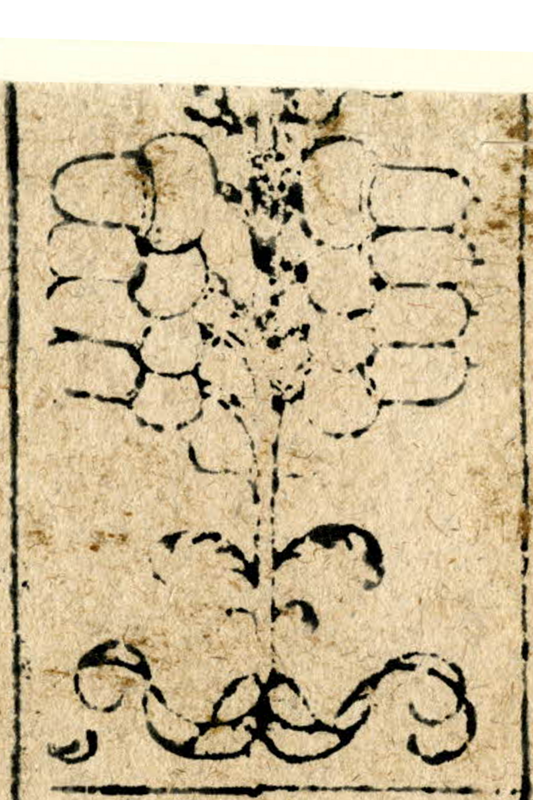 This arrangement strongly suggests that the designs are copies of existing cards which in turn were carved on woodblocks slightly larger than those available to our craftsman; otherwise the four remaining cards could have been squeezed in by making every card slightly smaller. 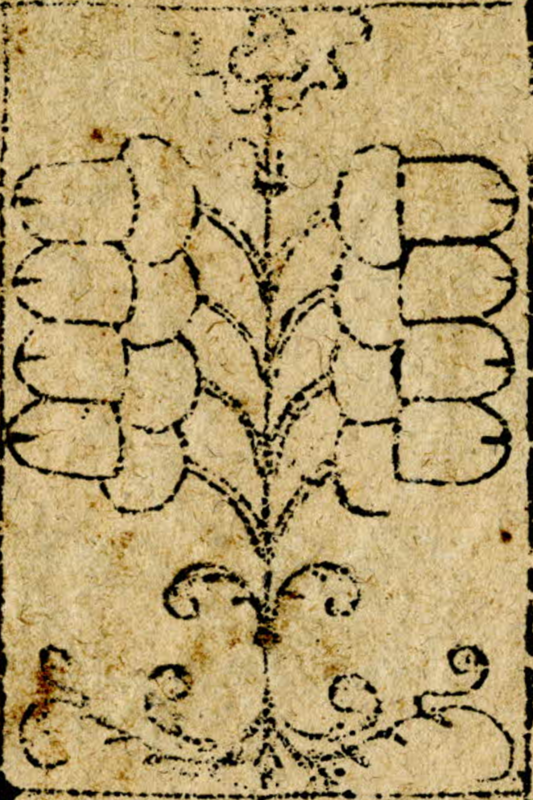 The reconstruction is based on the assumption that the two blocks, each surviving as a single incompletely preserved imprint, when complete had identical layouts. 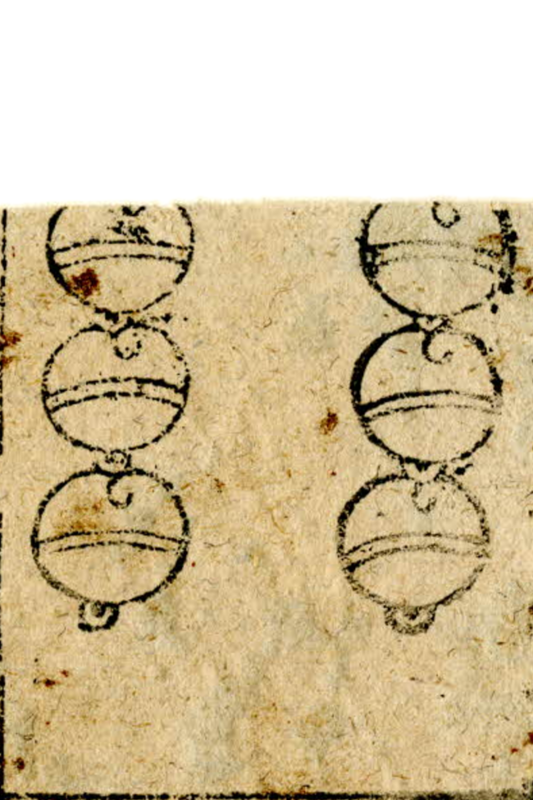 If so, the entire top row with rotated cards is missing from sheet 1, just as most of the bottom row is missing from sheet 2 and half of the rightmost column is from both. 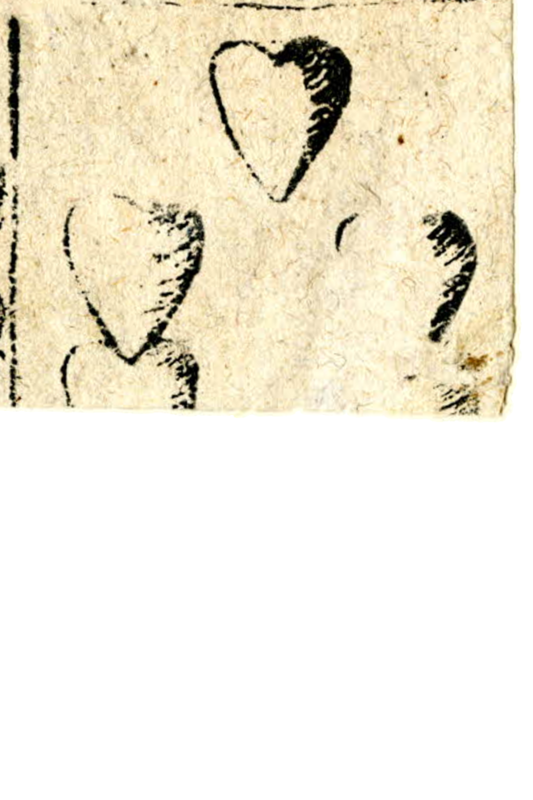 That they are preserved together (along with a related sheet and two unrelated fragments), have the same size and style, and have the same maker’s mark repeated three times in the center strips shows that they are at least made in the same workshop at about the same time. 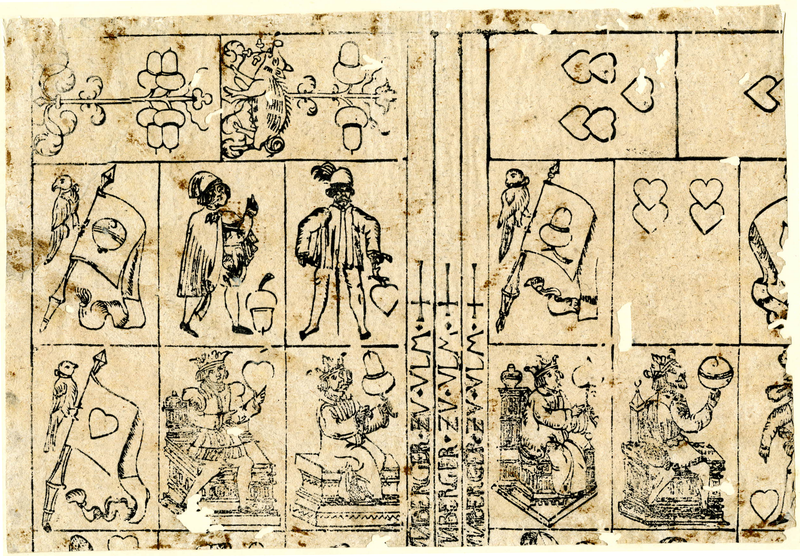 What makes it certain that they actually form two parts of the same deck is their complementary distribution of cards, as seen in the table below (even while disregarding the nine missing or unidentifiable cards indicated by question marks). 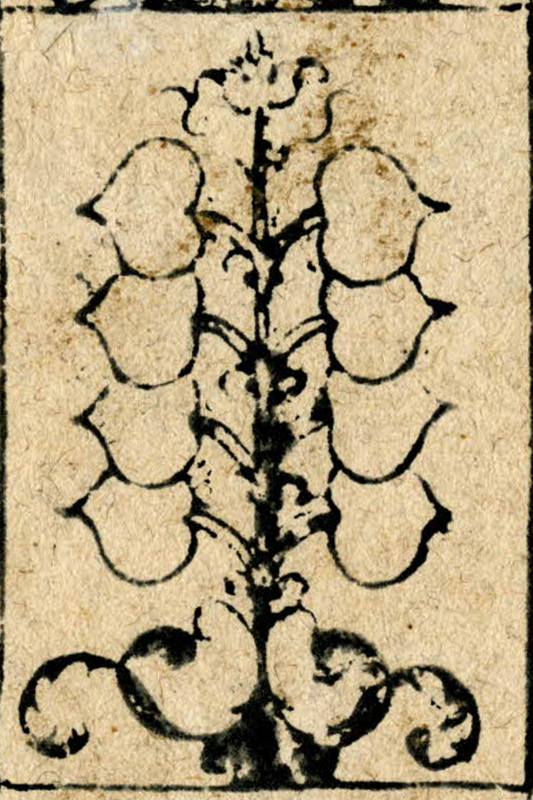 As mentioned above, the peculiar arrangement evident in sheet 2 only makes sense if it was impossible to get a larger number of cards of the desired size onto a single woodblock. 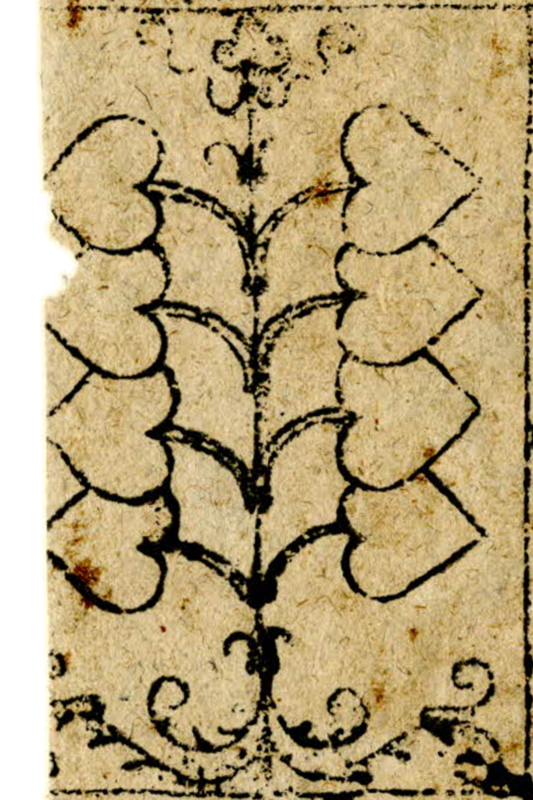 As the surviving part of sheet 1 structurally exactly matches the lower part of what sheet 2 must have looked like, it would be quite unreasonable to postulate a different layout of the missing top part, especially one that would give room for four more cards. 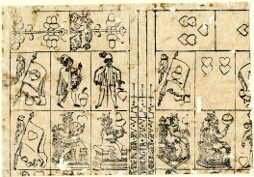 The table above makes the bold claim that the four cards lacking from these blocks are preserved in two fragments which ended up at the British Museum on two different occasions, both long before the main sheets. 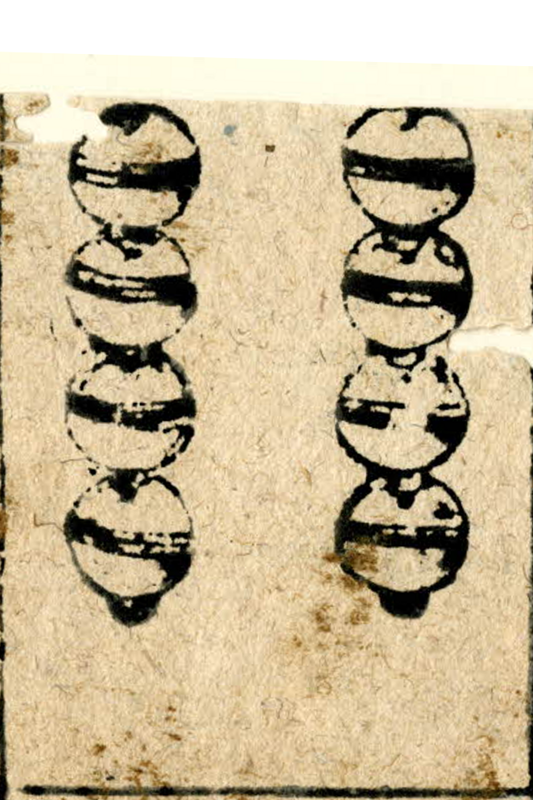 They are strips containing just two and three cards respectively, with the rightmost of one matching the leftmost of the other. 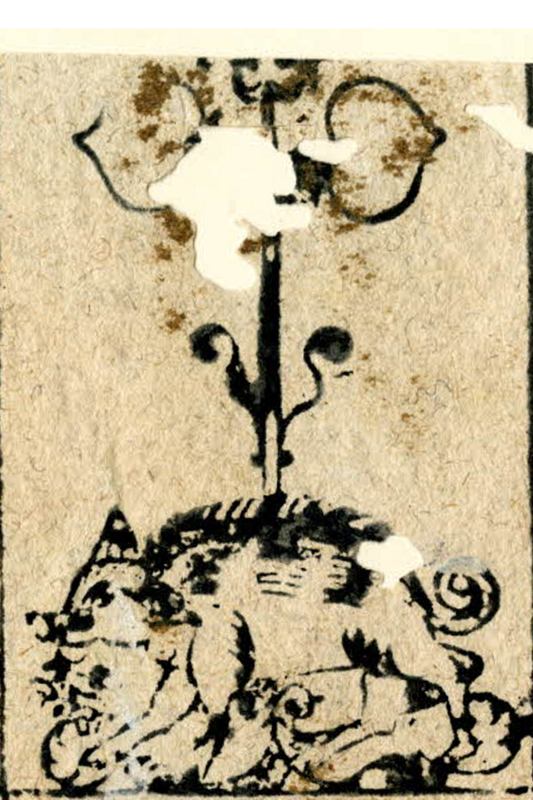 Because the latter is badly printed with a double exposure they look slightly different, but closer inspection shows them to be from the same woodblock. 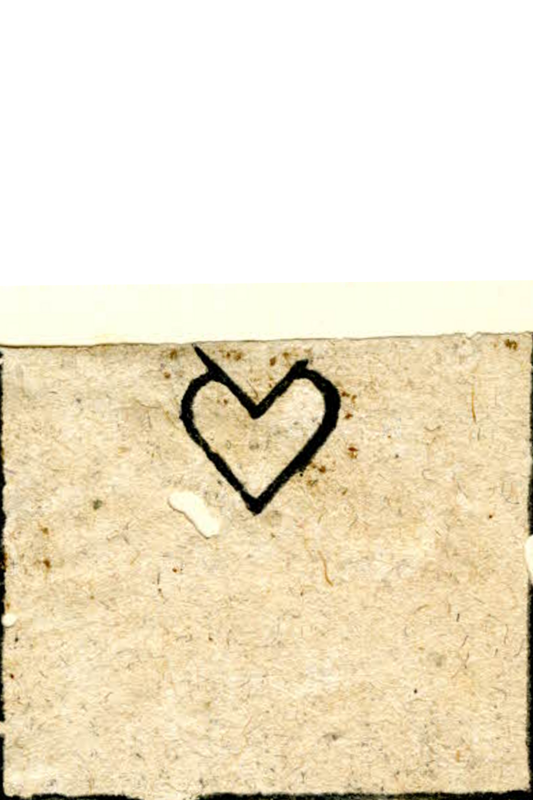 When combining these, we have a strip of the very four cards missing from the main blocks, in the same style, with the exact same dimensions and with a band of text in the same style reading ZV VLM followed by a monogram discussed below. 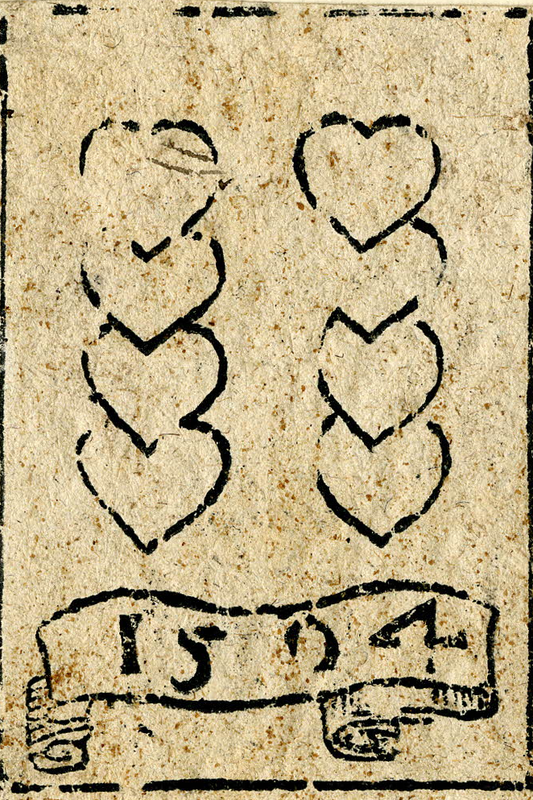 Blocks 1 and 2 have three copies of a narrow band in the center, containing the maker’s signature. 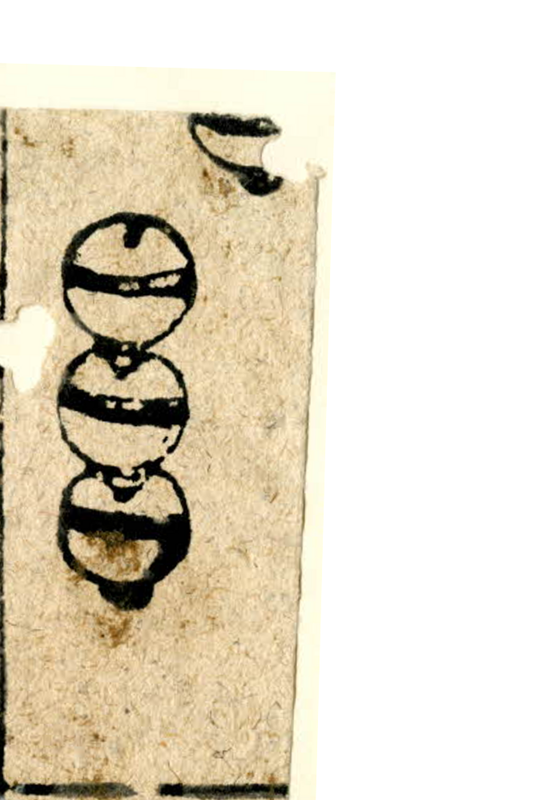 This reads ❧PALVS·​ZAVNBERGER·​ZV·​VLM+ in sheet 1, though the first third is very smudged and nearly illegible in all three copies, and the corresponding part is is missing from sheet 2. 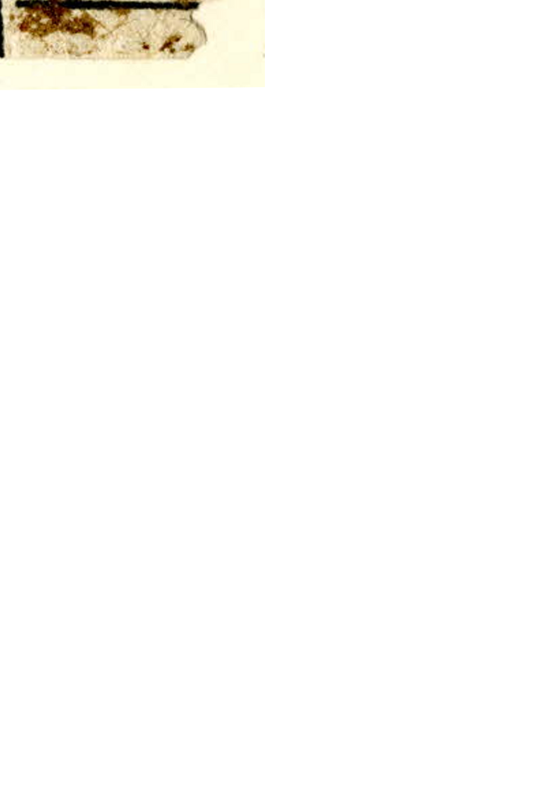 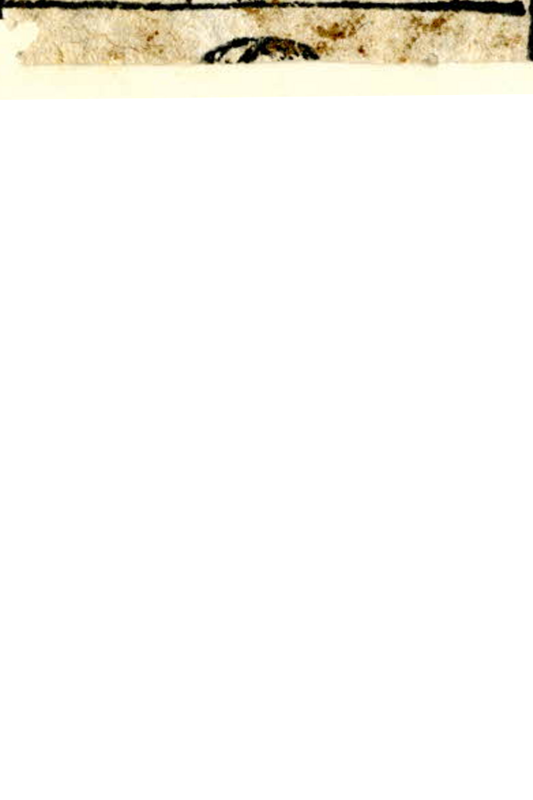 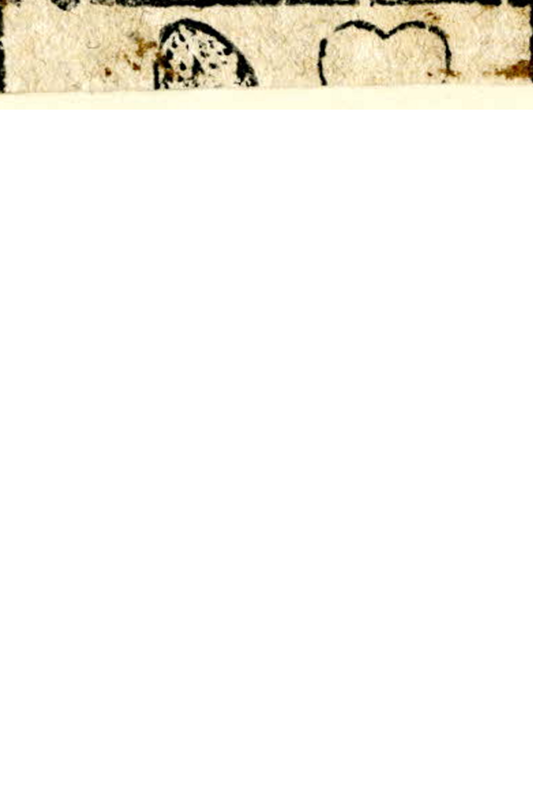 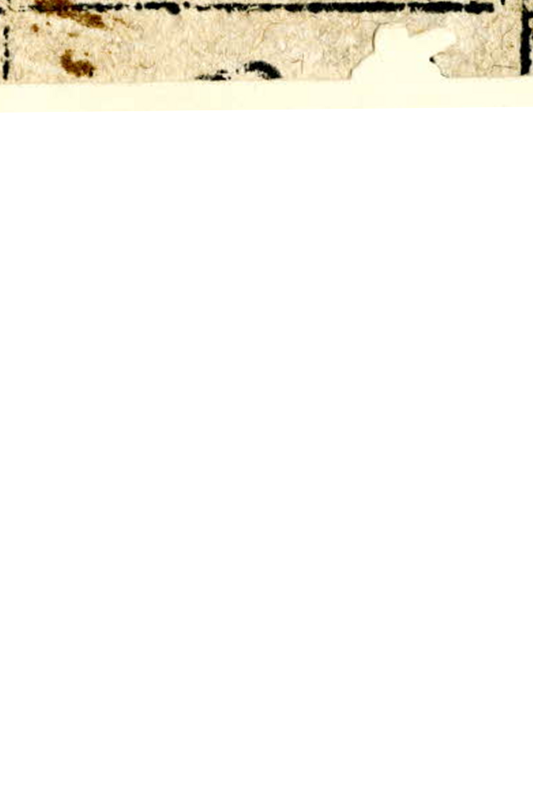 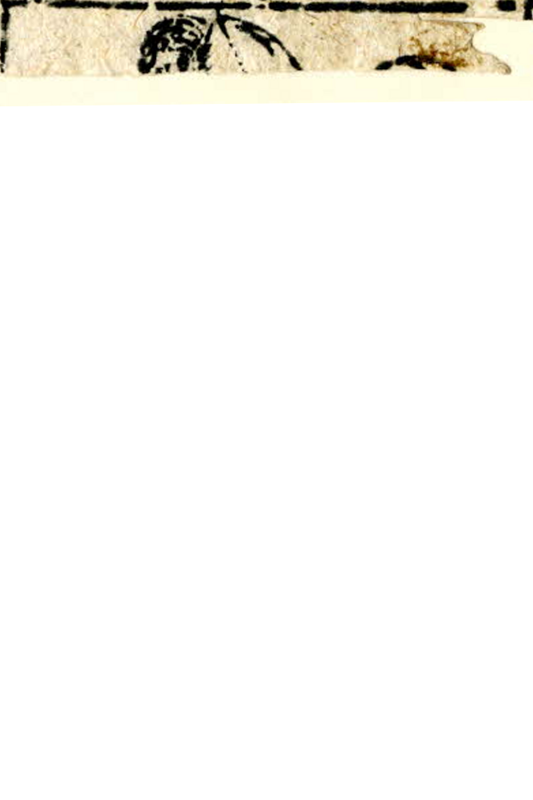 There does not seem to be enough space that the first name could have been PAVLVS , even using a ligature. 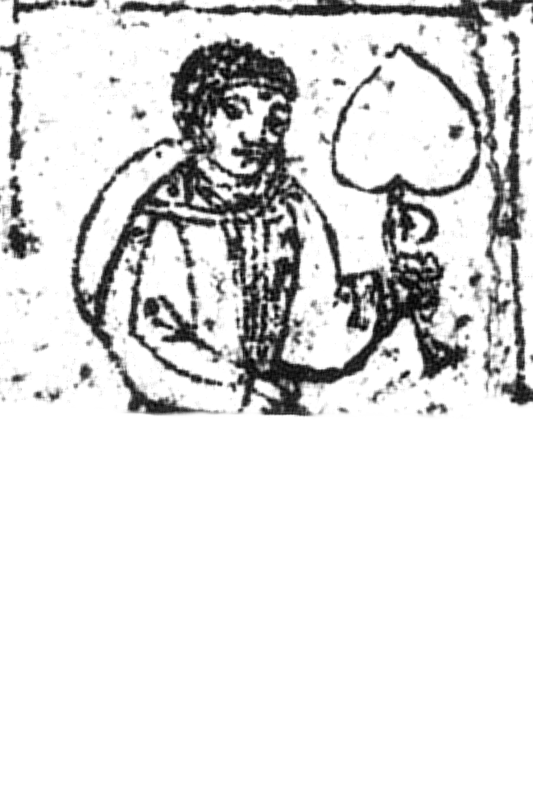 Regardless, the intended name must have been Paulus . 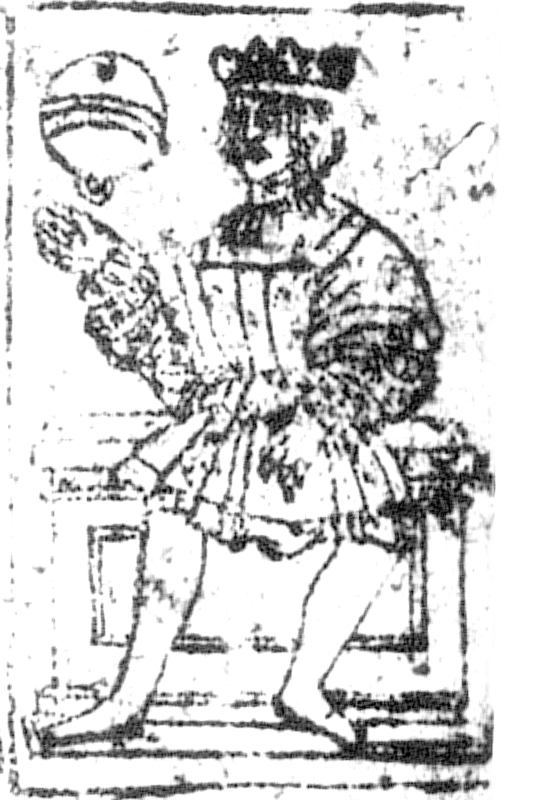 The name Paulus Zaunberger appears in genelogical data from Ulm in the right period. 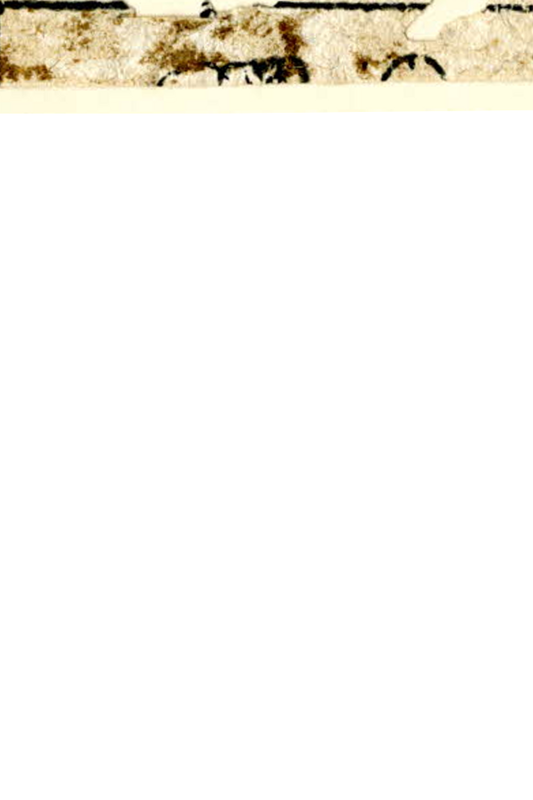 This does not have to be the same person, but shows that this name was used in the Zaunberger family. 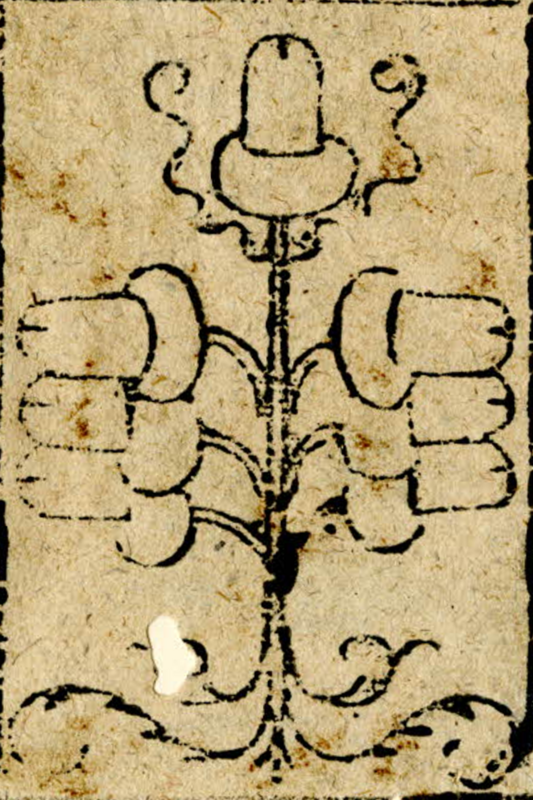 Three of the four cards from block 3 contains information below the suit symbols. 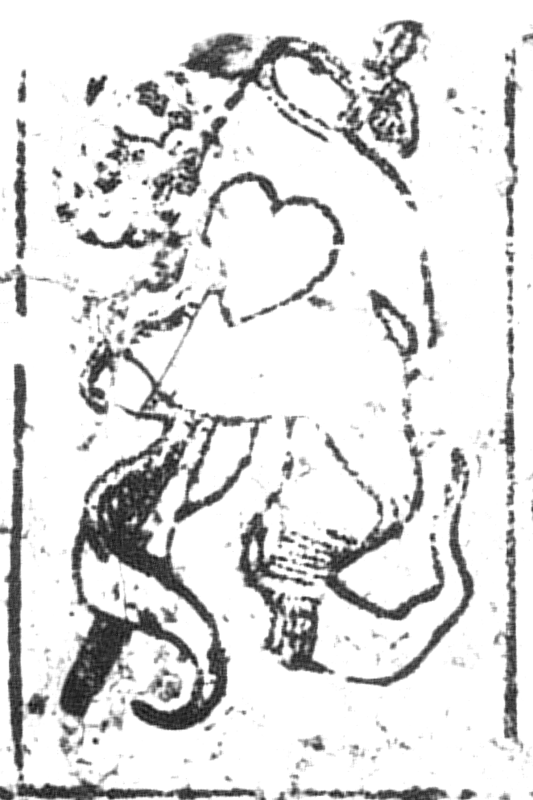 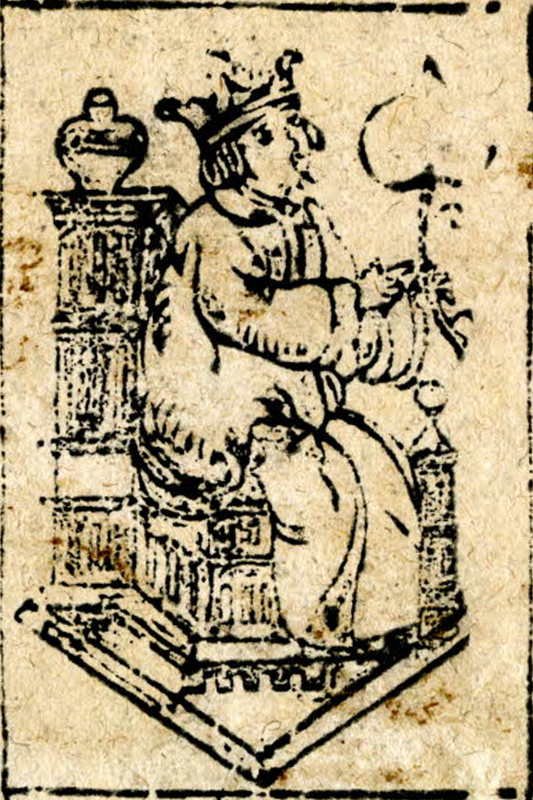 Starting from the left, the eight of hearts has a scroll with a year written on it. 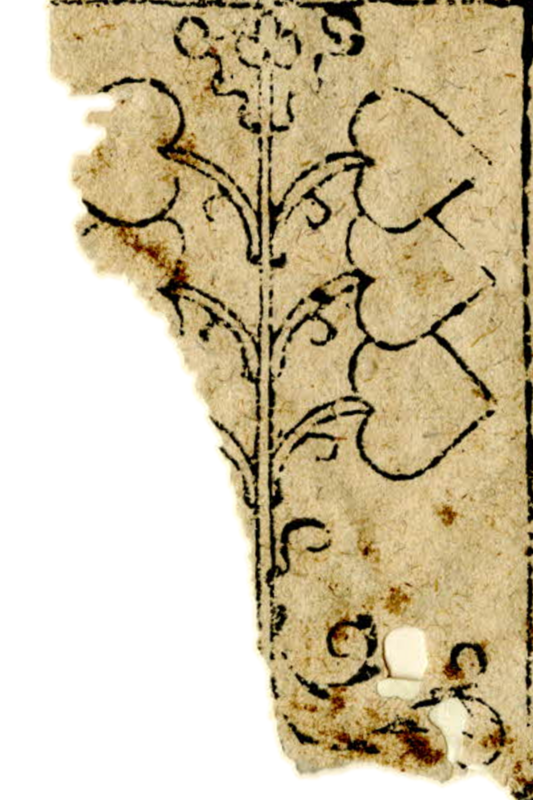 Superficially this seems to read 1504, but 1594 might be a just as likely reading. 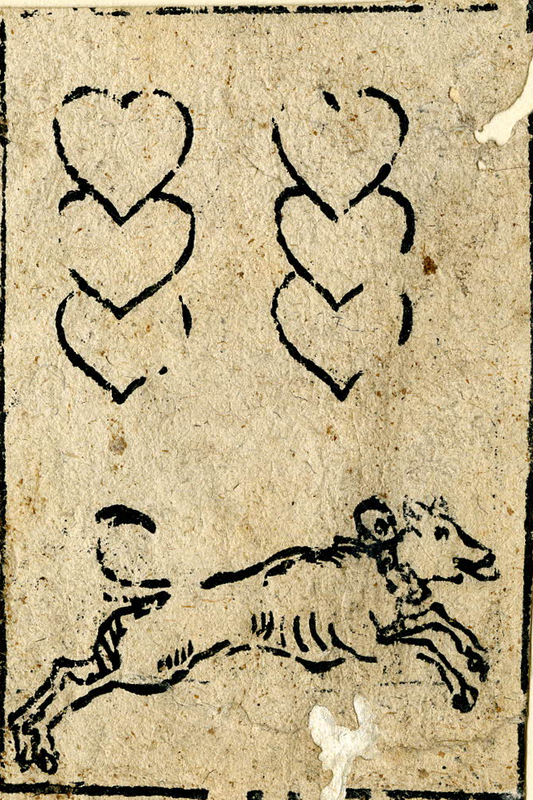 The six of hearts has a leaping dog, which is likely to be some sort of logo used by the artist or publisher as the other pip cards do not have vignette illustrations. 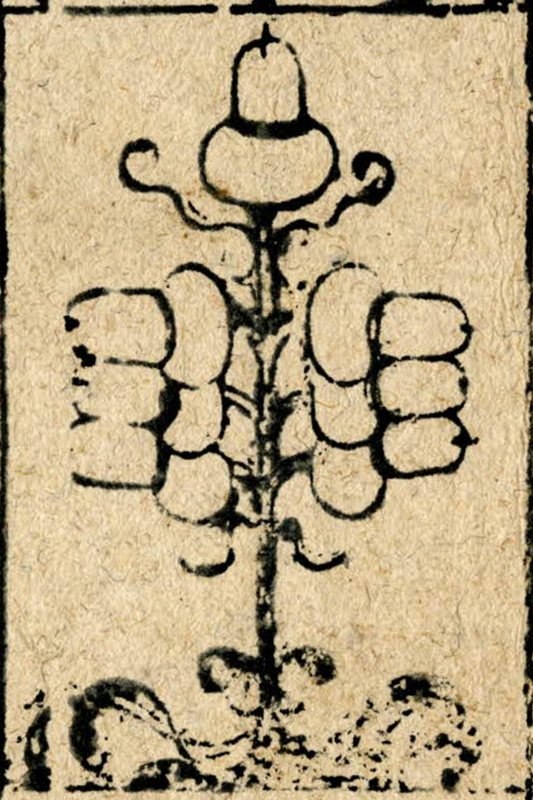 Finally, the nine of hearts has a three-letter monogram, tentatively read as ITZ (?) 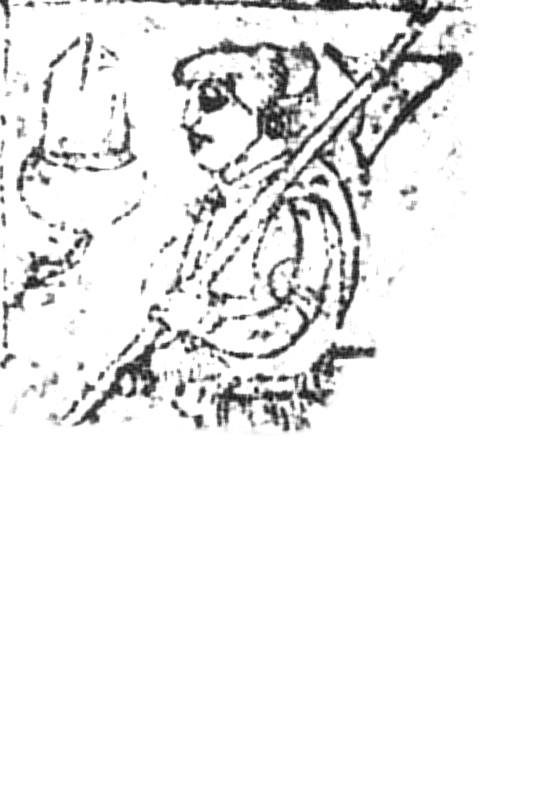 by the British Museum, but much more likely to represent THZ or possibly HTZ . 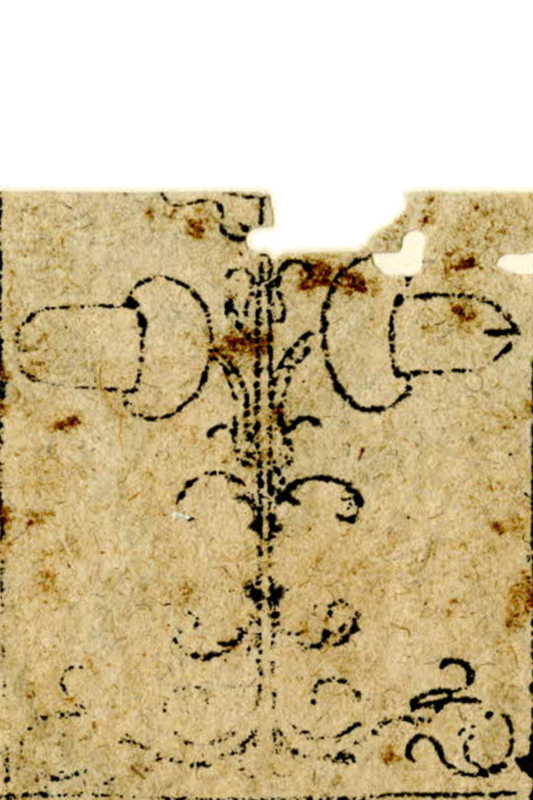 In the margin of fragments BM 1867,0309.296 and BM 1872,0608.356 is written ZV VLM [THZ] · using the same monogram. 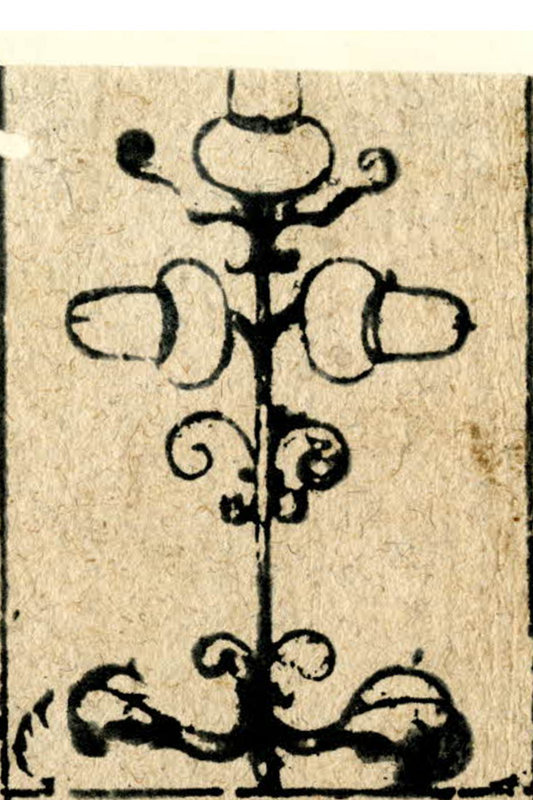 The Z of the monogram almost certainly represents Zaunberger . 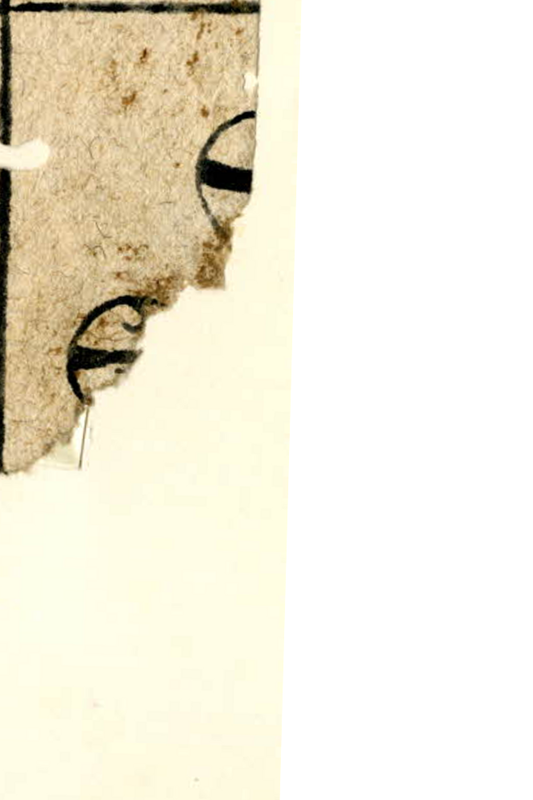 However, neither TH nor HT matches Pa(u)lus as a first name. 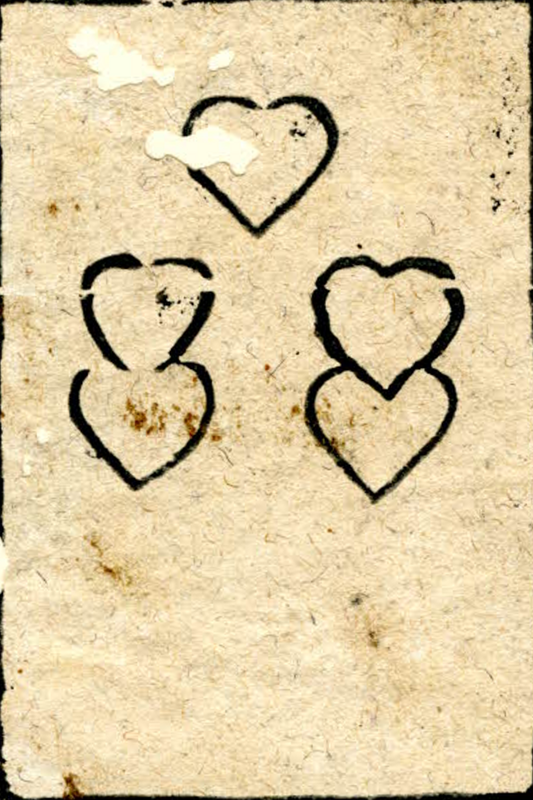 The three groups of fragments that make up the deck described above also contains cards from other decks. 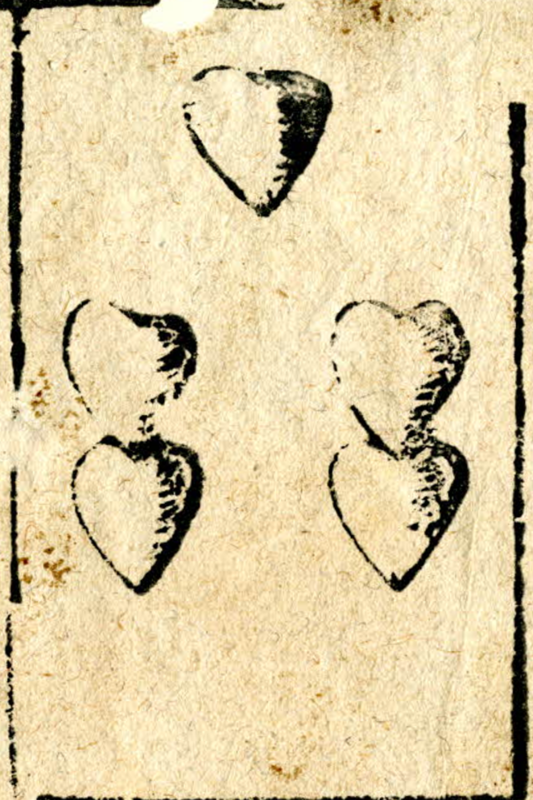 The largest remaining fragment and three smaller ones are in a very similar style, and presumably form parts of another deck by the same maker, mainly differing in the design of the deuces (though all tens and most court cards are missing). 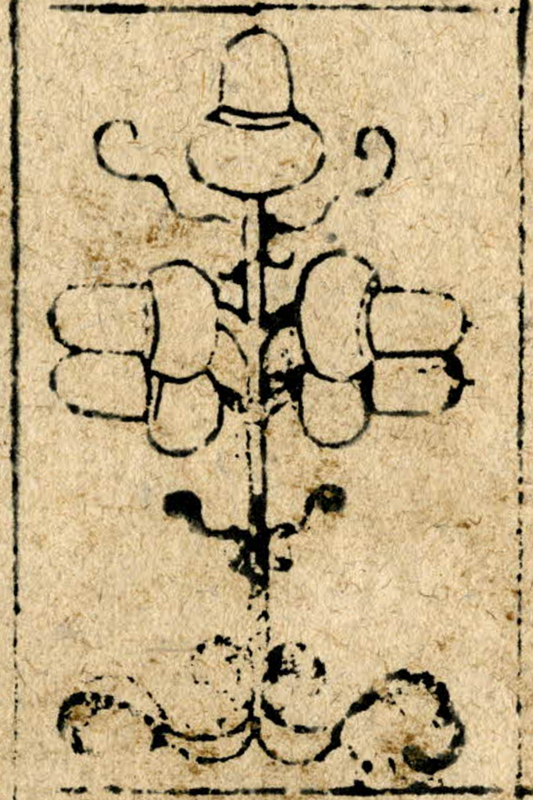 Only two deuces are preserved. 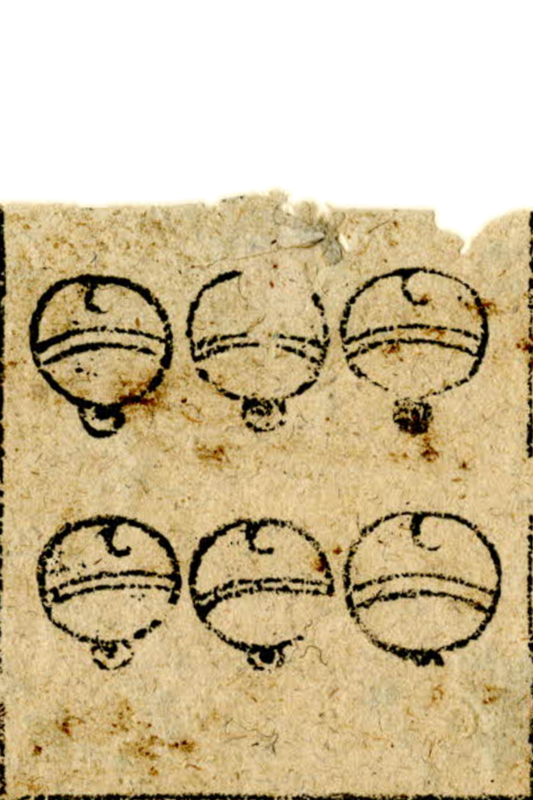 One ot them lacks the suit symbols, but may from its placement on the sheet be assumed to be of acorns. 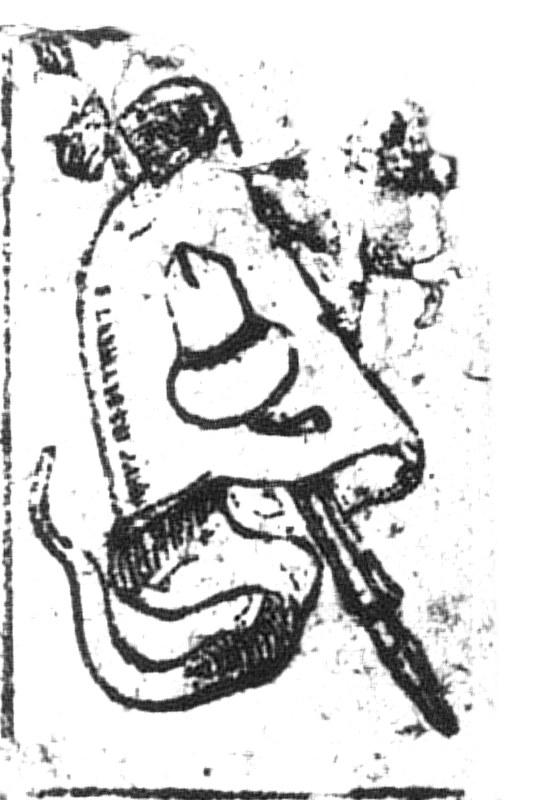 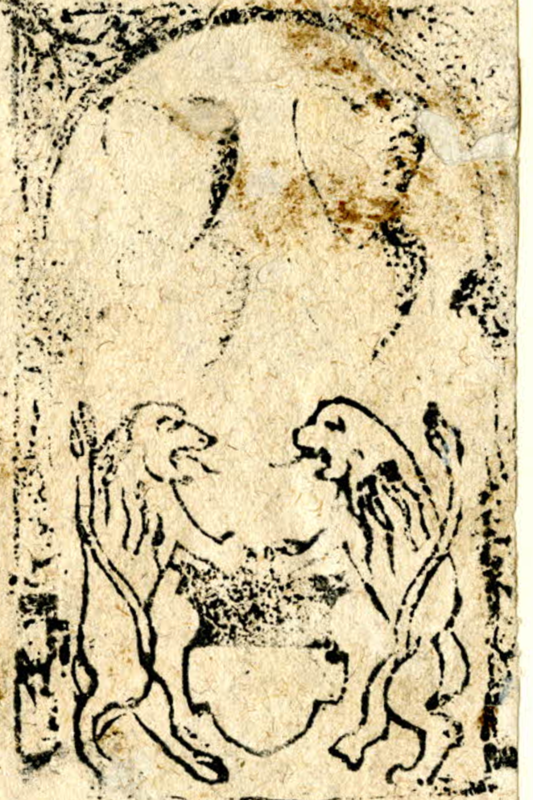 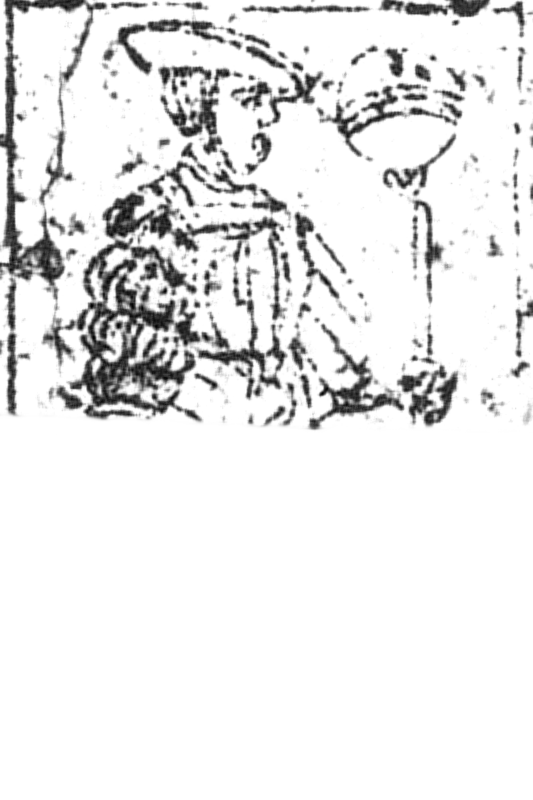 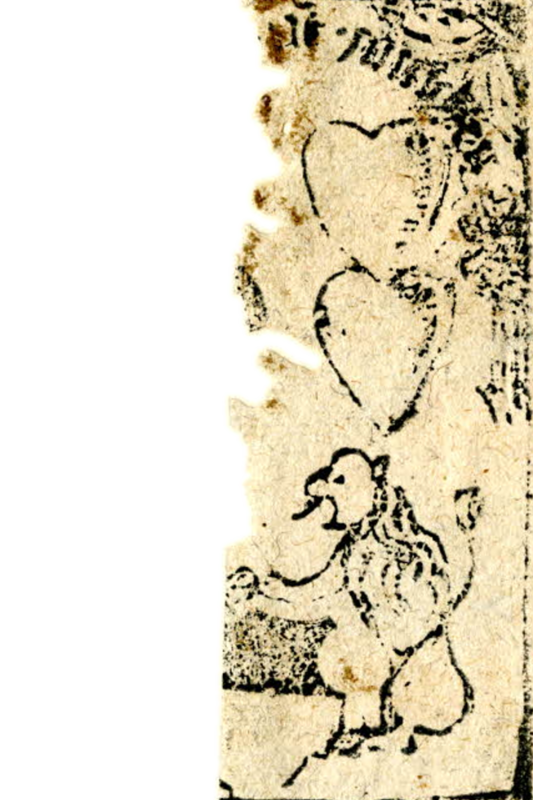 It is unfortunately a bad impression, but seems to depict a banner with the maker’s name above a lion holding a monogrammed shield. 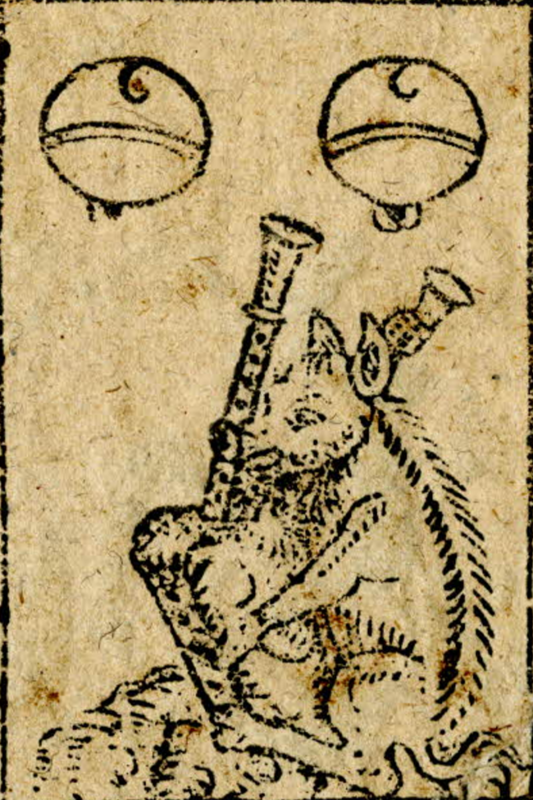 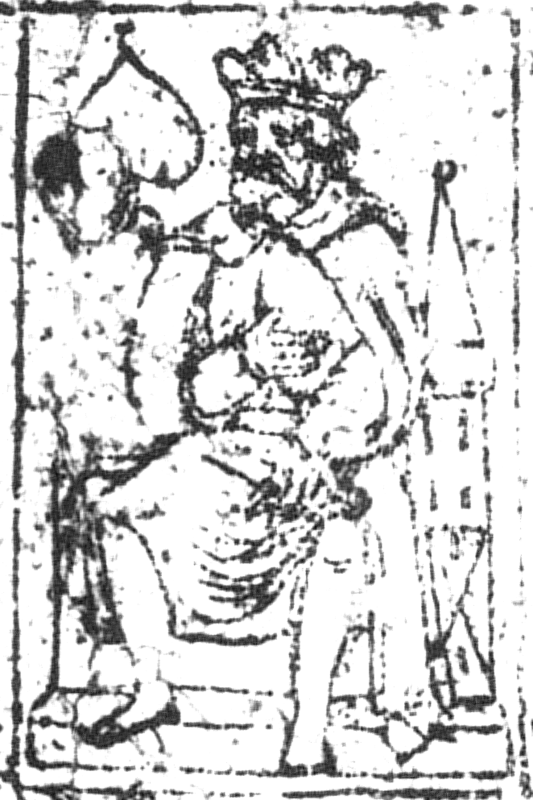 The deuce of bells depicts a sow playing bagpipes. 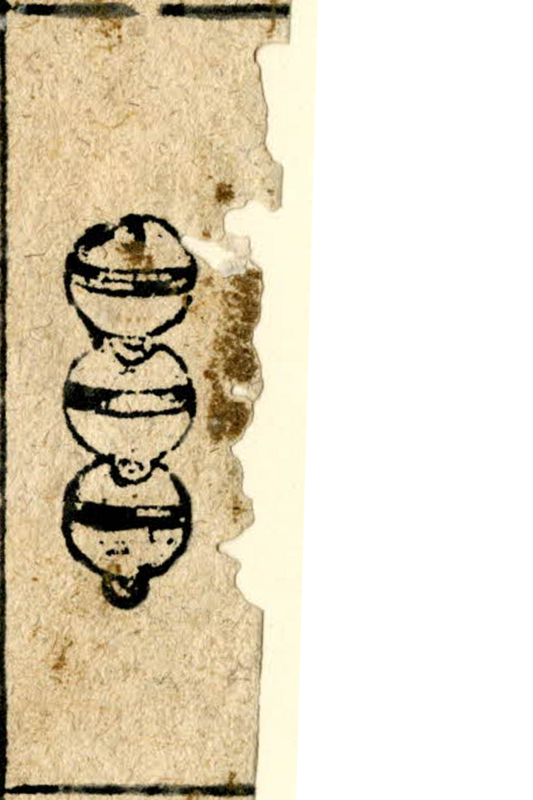 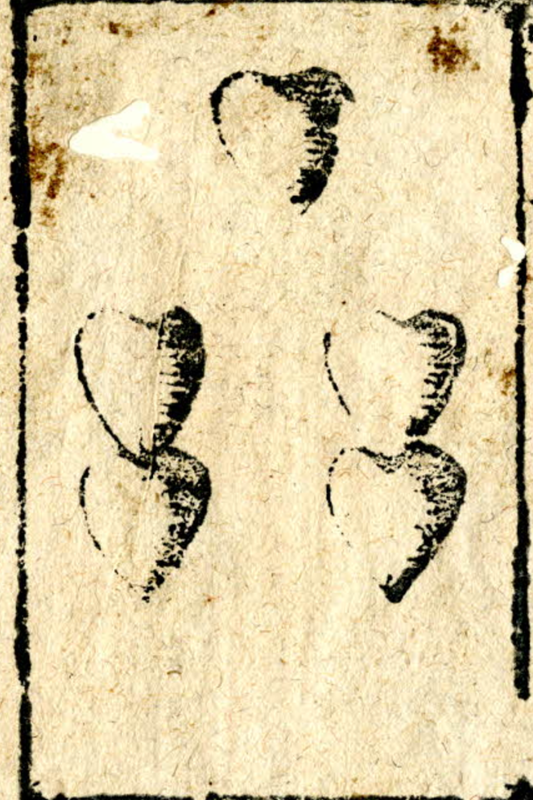 In this case it is less certain that all three fragments form part of a single deck and not two or thee similar ones. 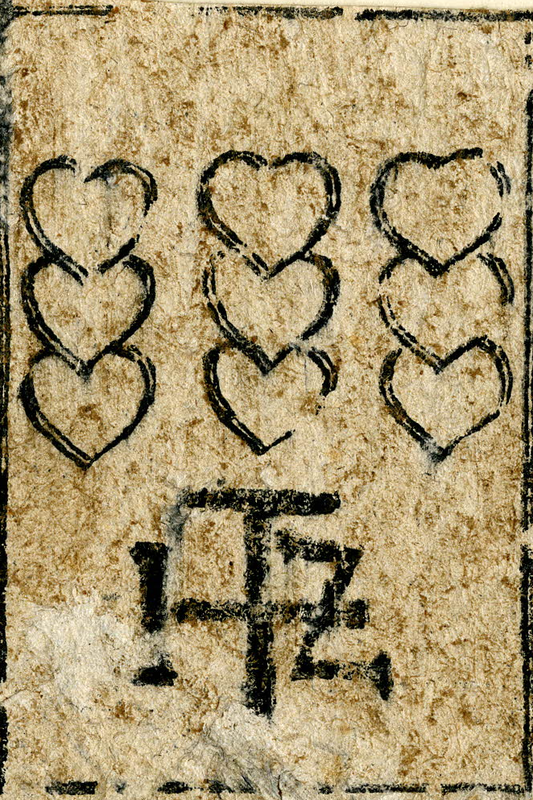 The six and nine of hearts have the same special features as in the more completely preserved deck, but the largest fragment does not show any signs of having the peculiar 22-card layout resulting in four cards having to be printed separately from the main printing blocks. 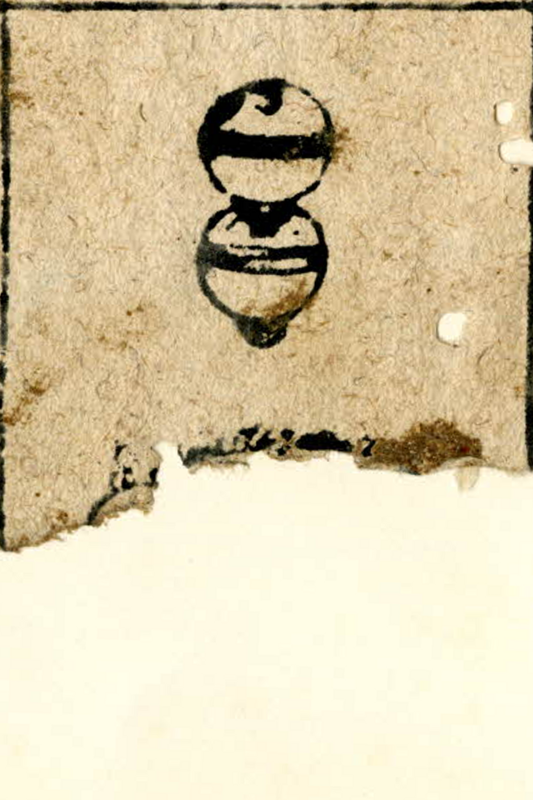 Fragment 1 contains eighteen cards and a maker’s signature missing the first part. 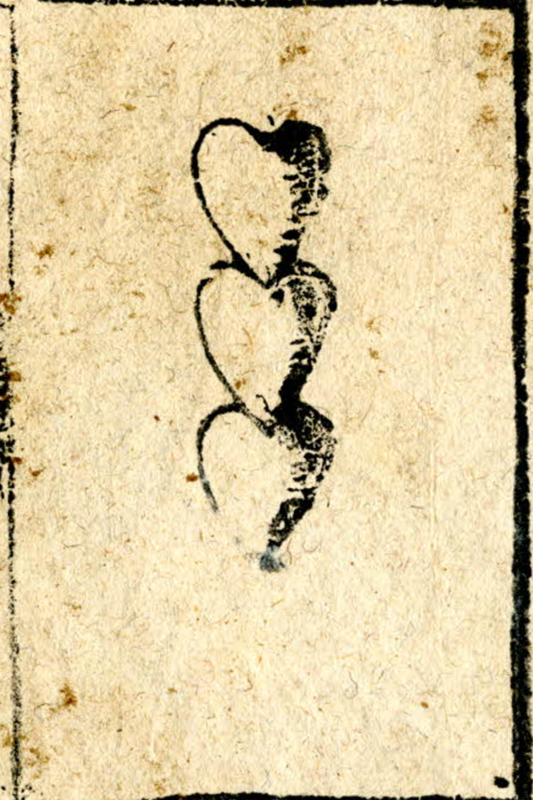 This signature is almost identical to the one repeated three times in the deck described above, reading …·ZAVNBERGER·ZV·VLM·+ . 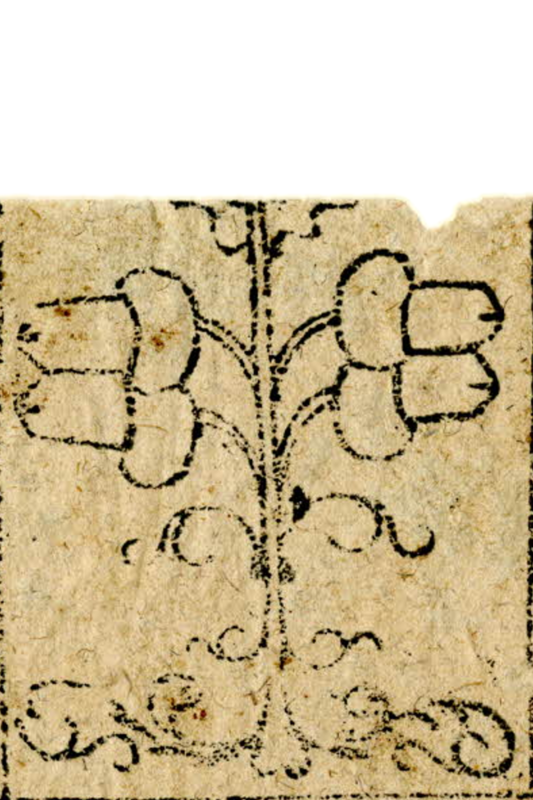 The lettering style is identical, down to the reversed N, the square dots separating the words and the cross following the text. 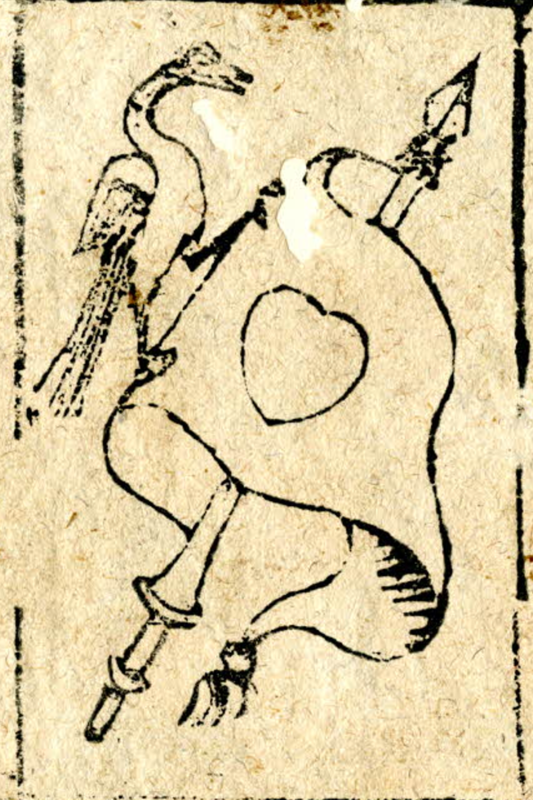 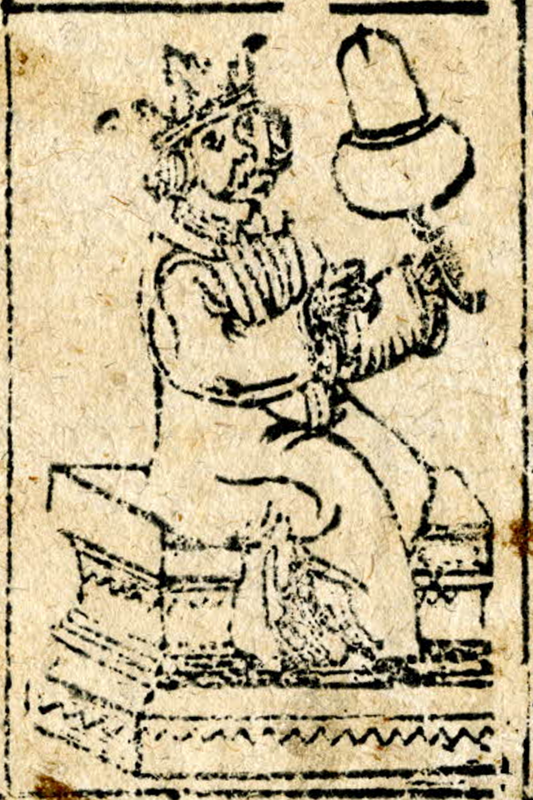 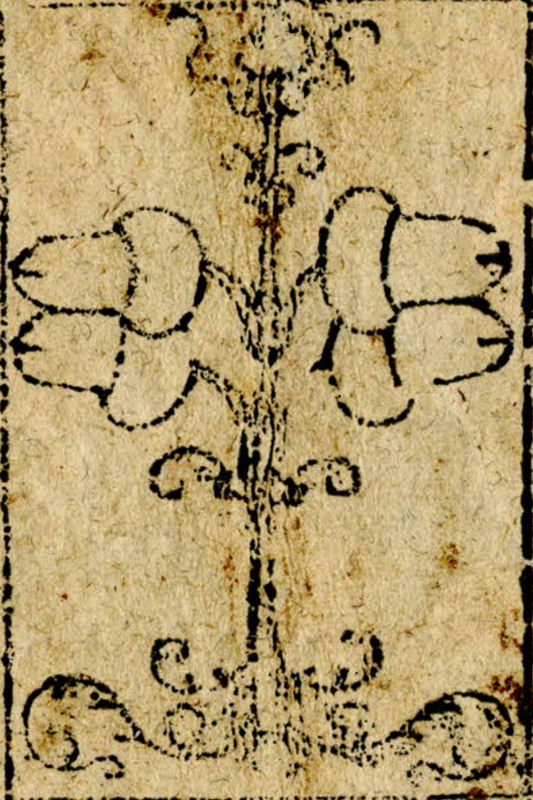 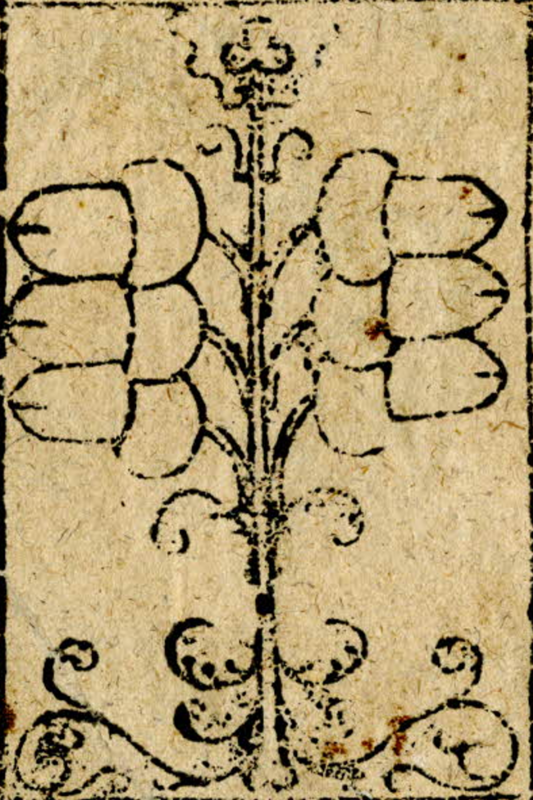 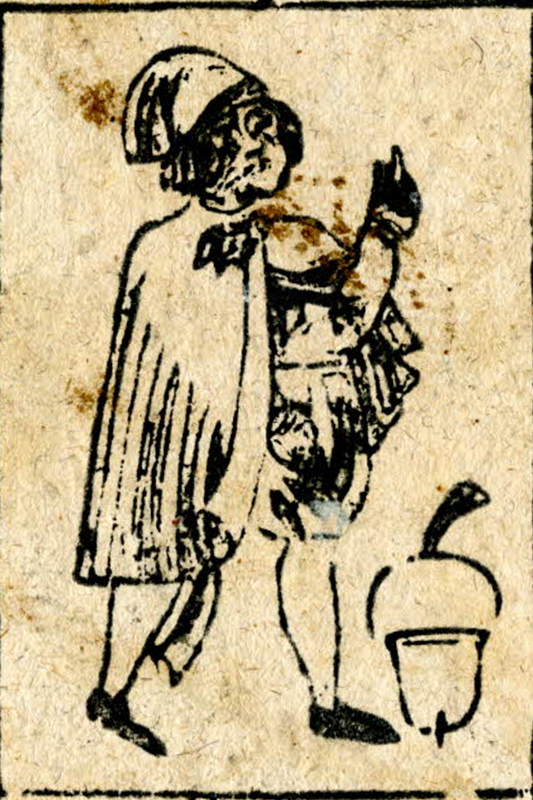 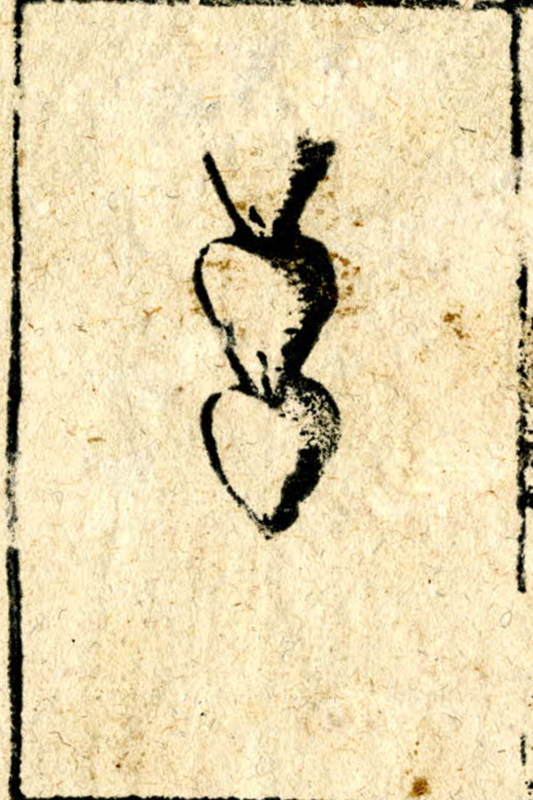 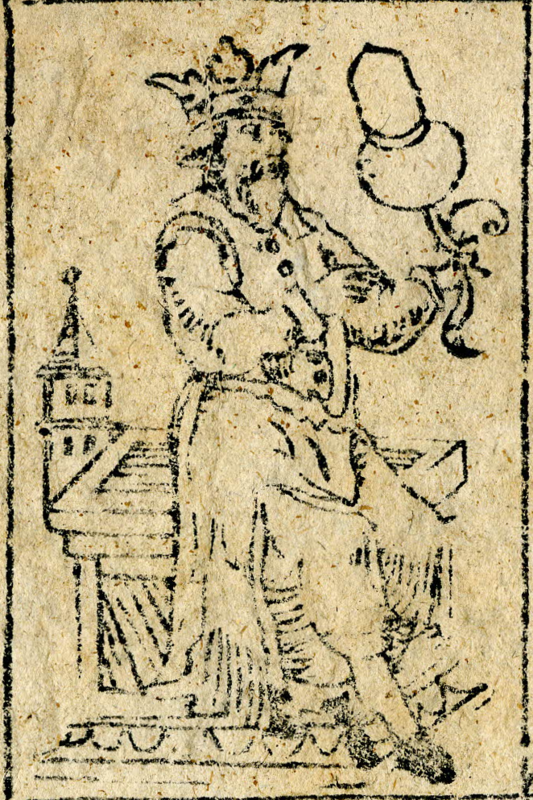 The deuce of acorns contains a scroll with the text ZAVNBERGER and a shield with a monogram that is not perfectly printed, but is presumably the same as on the first deck. 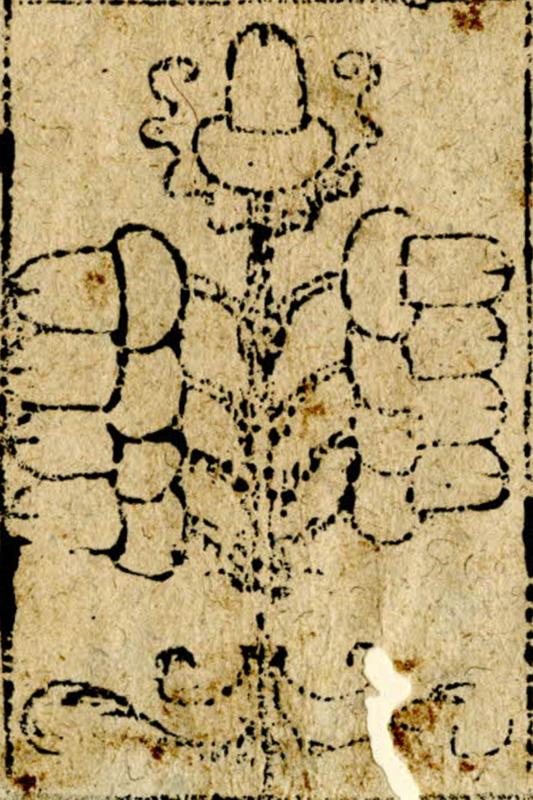 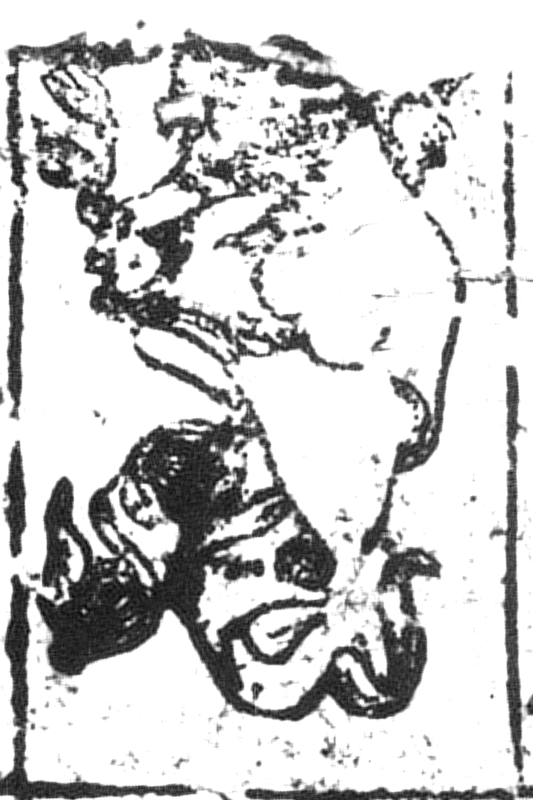 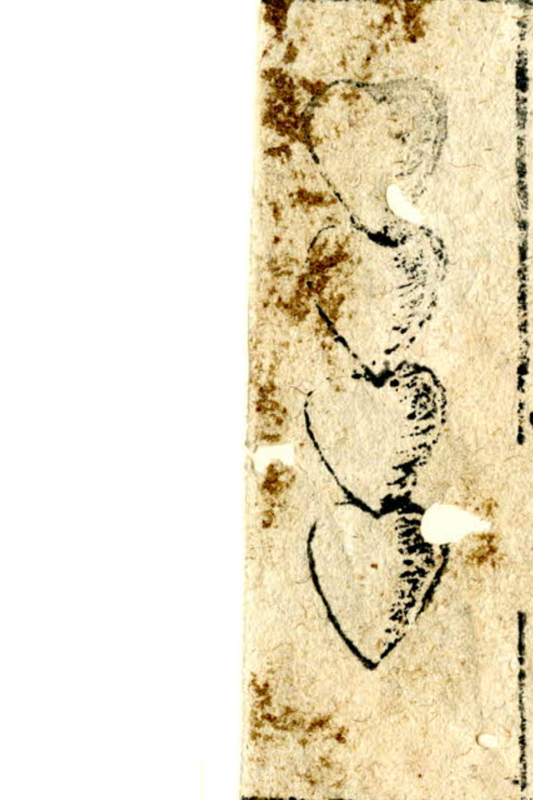 Two fragments from different groups are different imprints from the same woodblock. 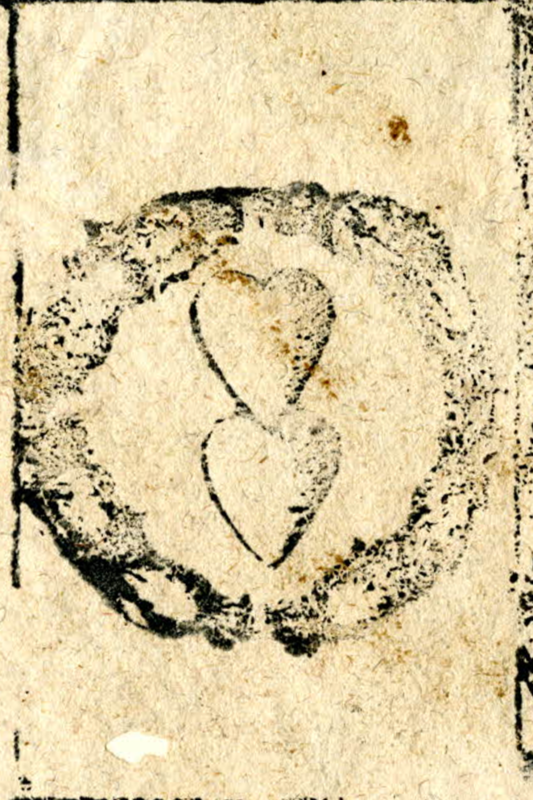 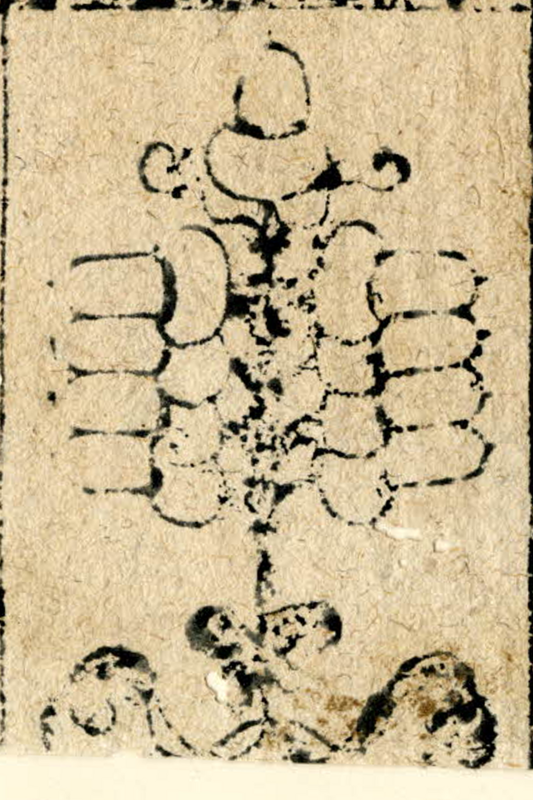 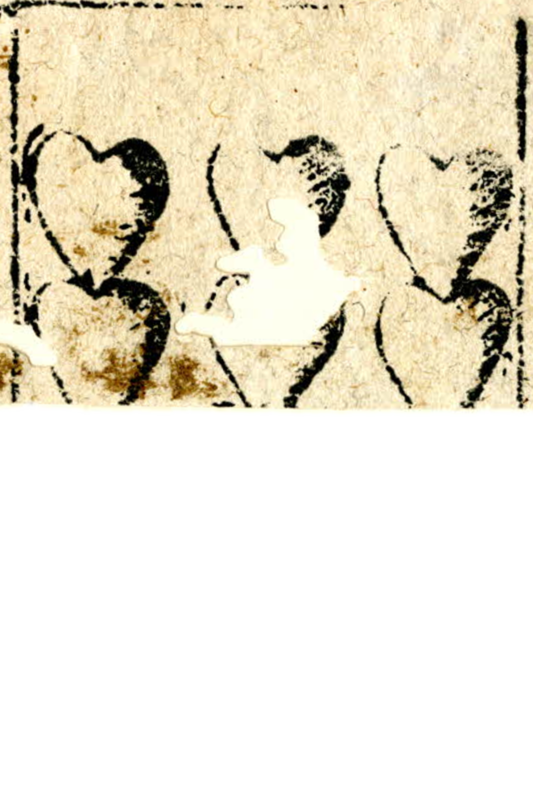 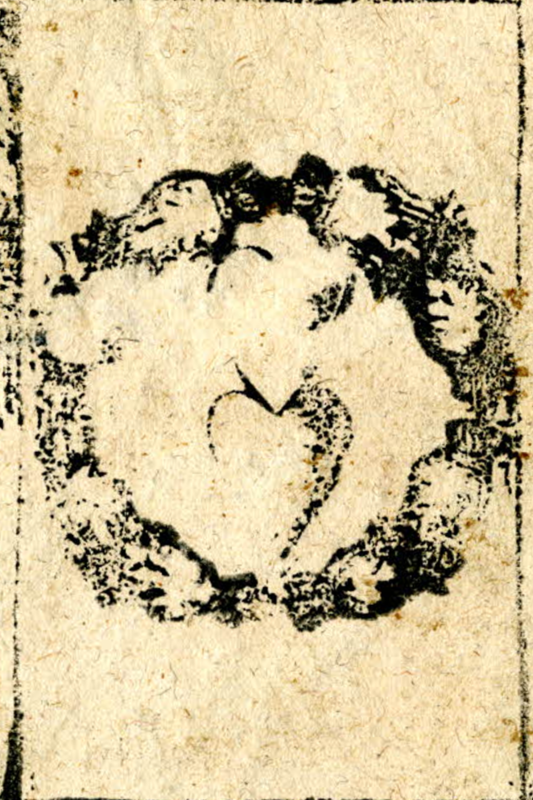 BM 1867,0309.295 contains the complete six of hearts and the rightmost edge of the nine of hearts which is preserved in its entirelty in BM 1872,0608.358. 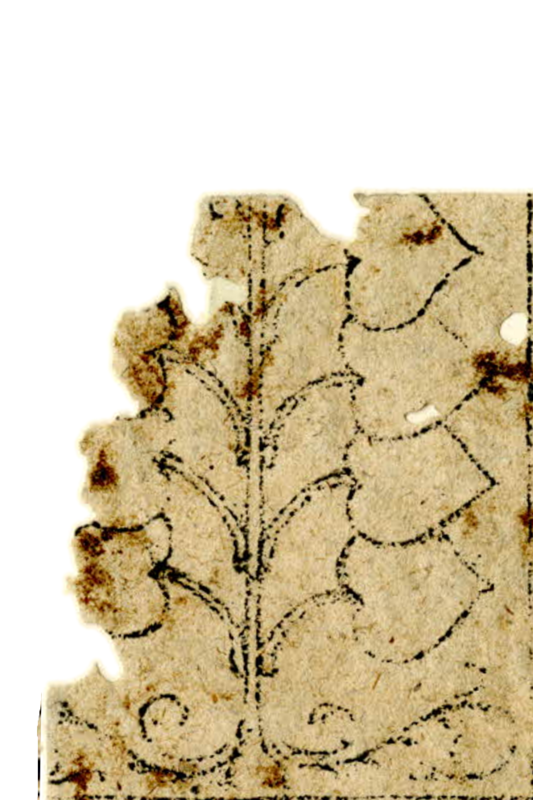 In the table above these are jointly denoted fragment 2. 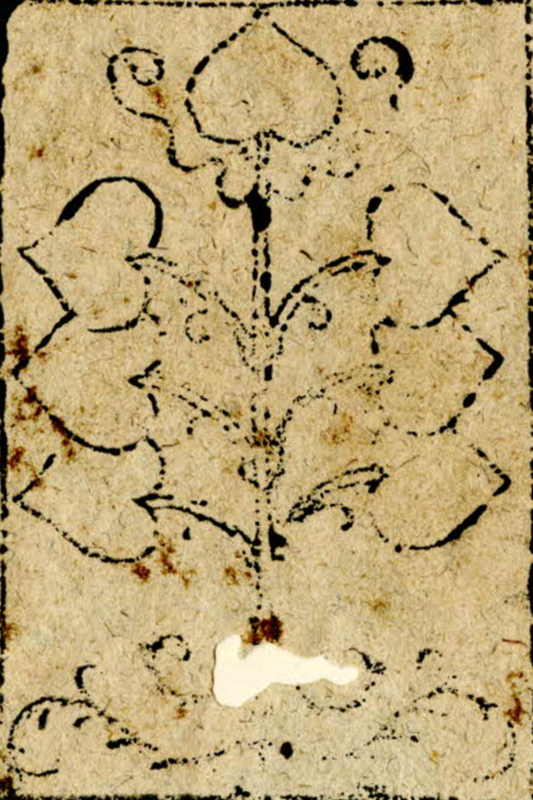 The nine contains the monogram found on the first deck. 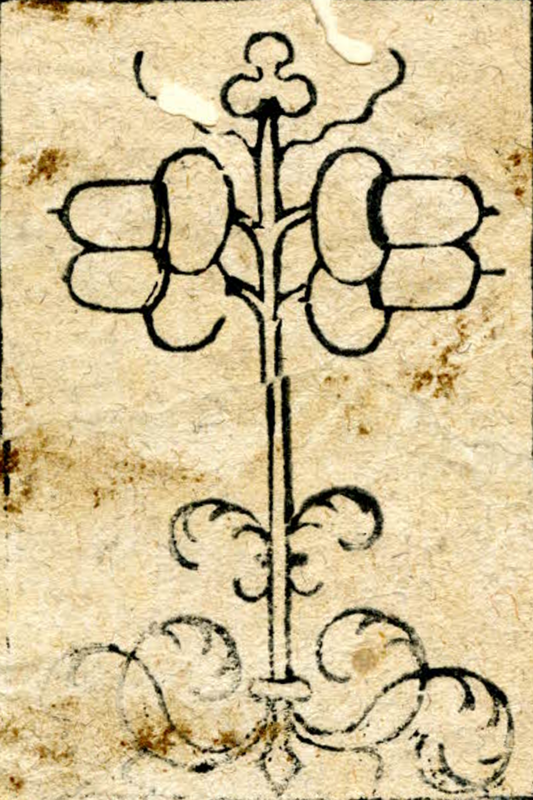 Fragment 3 contains the kings of acorns and bells. 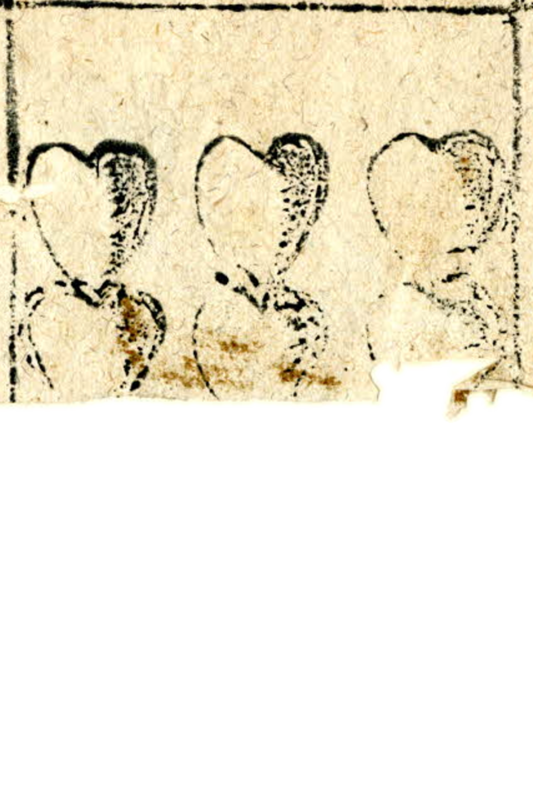 These have the same designs as those on sheet 2, only somewhat more detailed and with the king of bells mirrored. 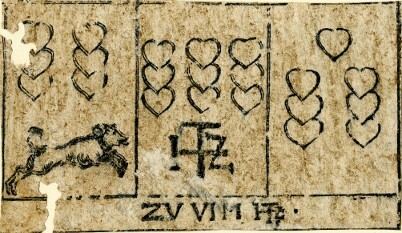 Beside the cards is the text ZV VLM in the same lettering style and followed by the same monogram, tying all groups of sheets and fragments closely together. 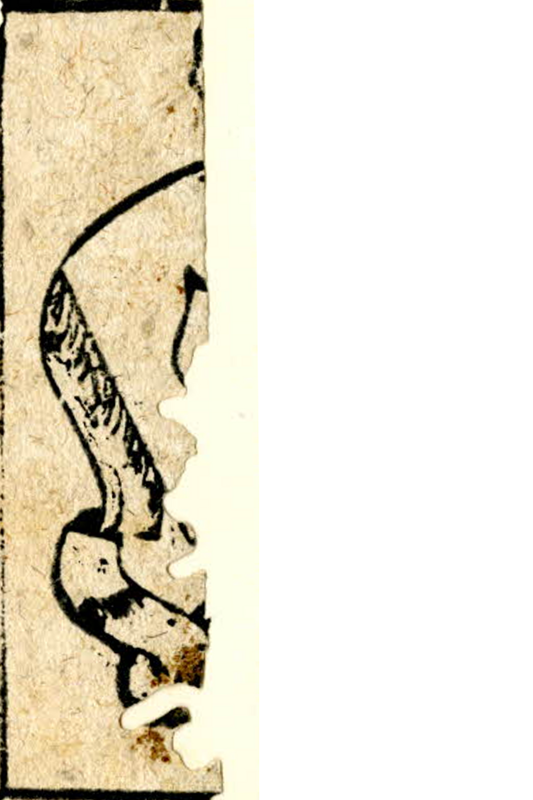 Apart from the fragments mentioned above, one of the gropus in the British Muesum contains two additional items. 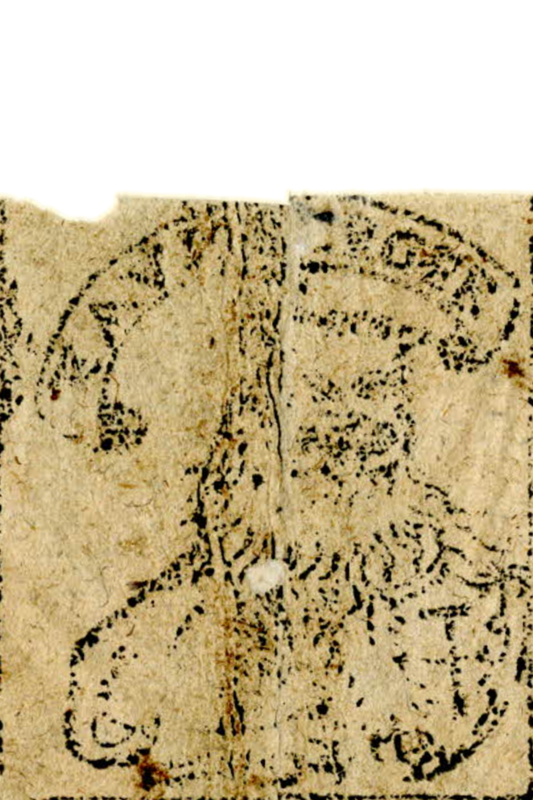 BM 1904,1231.5 is a very minor fragment. 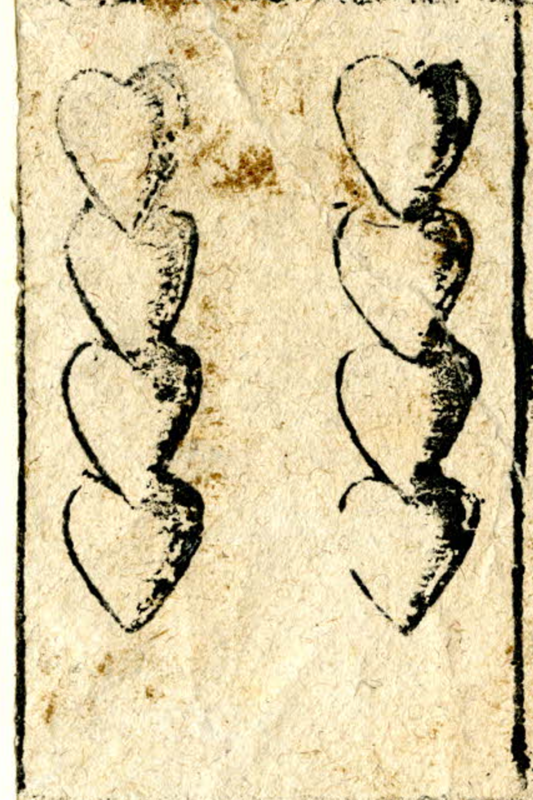 It is similar to the two decks already mentioned, but not as similar as those are to each other. 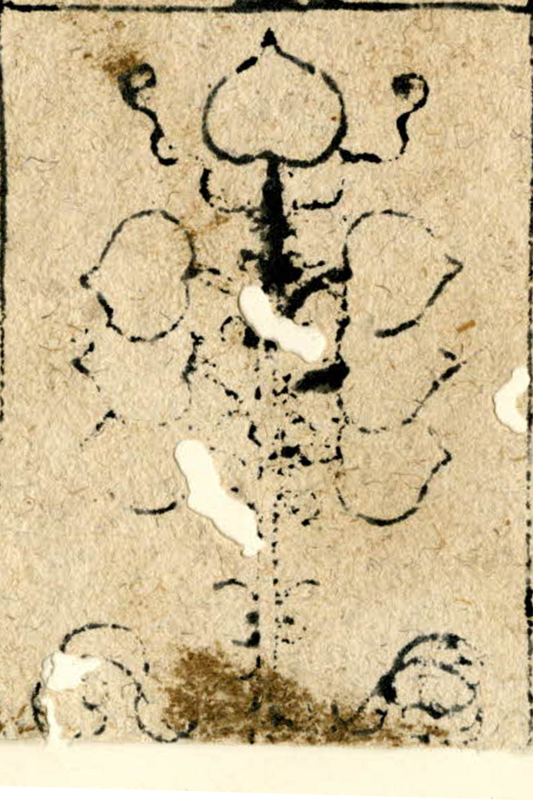 BM 1904,1231.4 on the other hand stands quite a bit apart from the rest stylistically. 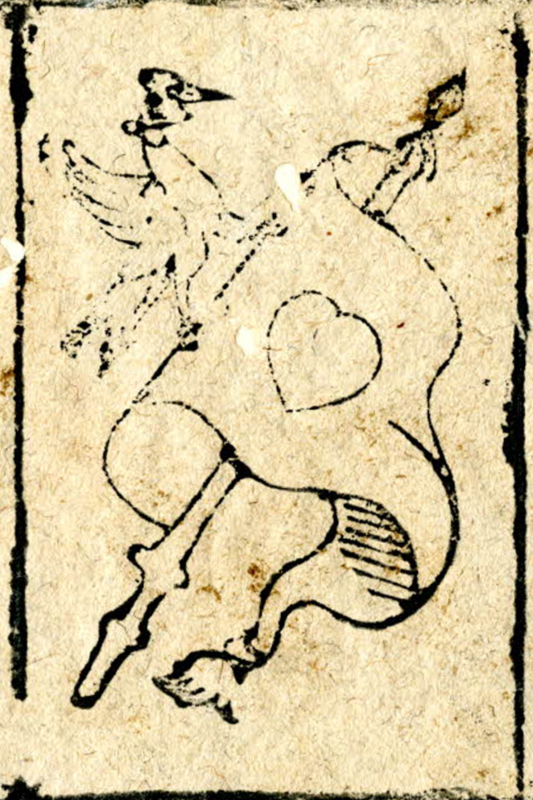 The sheet is divided in two, with each half containing a copy of the cards deuce to ten in the suit of hearts. 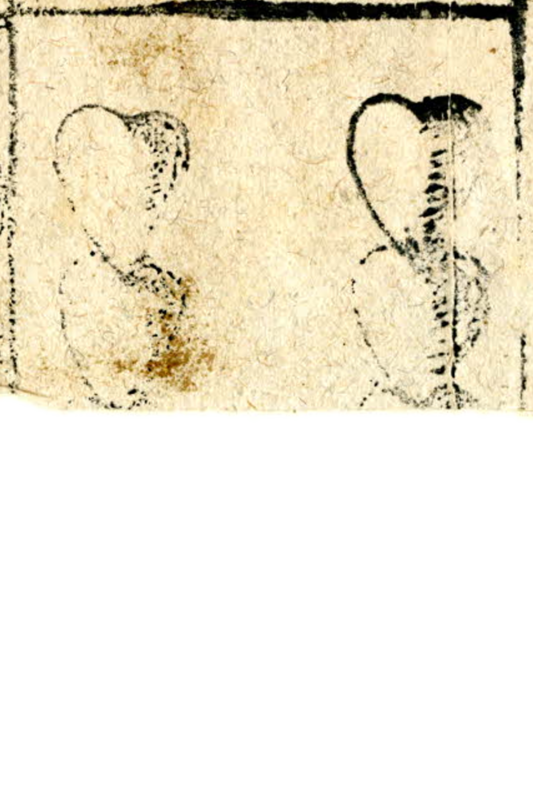 The two versions of each card are of the same design, but not similar eough to be direct copies of the same source. 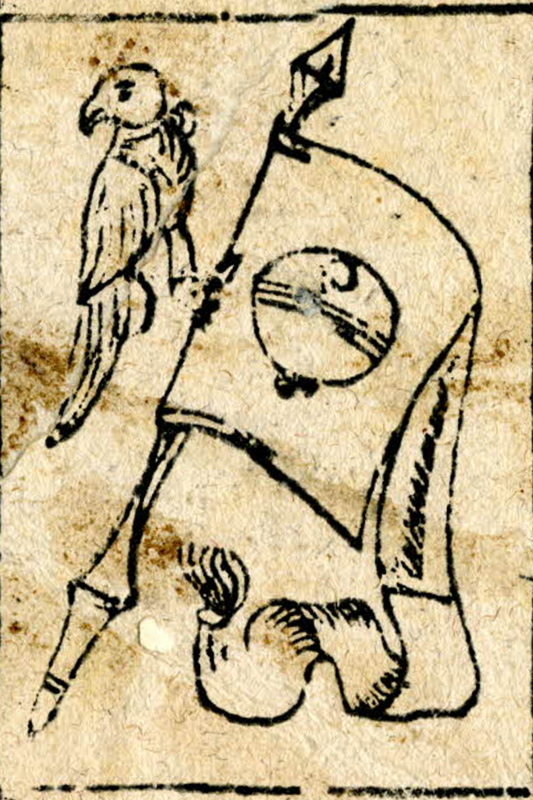 The ten is also here a banner ten with a bird perched on the banner, though in a more refined style than in the other decks. 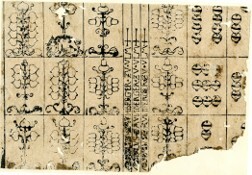 It strongly resembles the corresponding card on a sheet in Deutsches Spielkartenmuseum (Inv.-Nr. 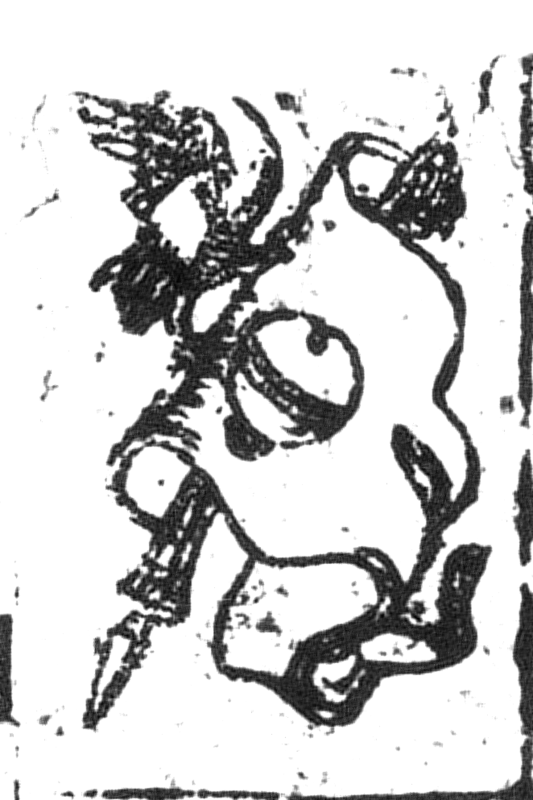 B122). 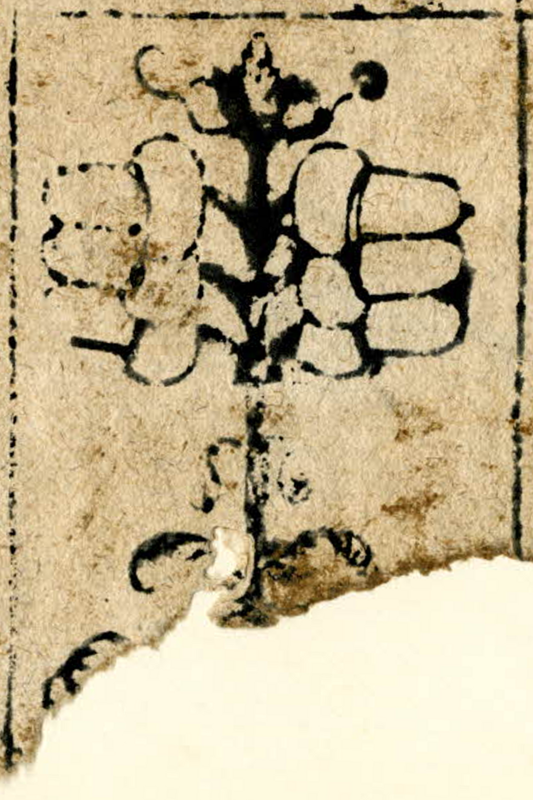 This also has a single band identifying the maker; here in lowercase: ❧ierg·​zaunberger·​zu·​ulm+ . 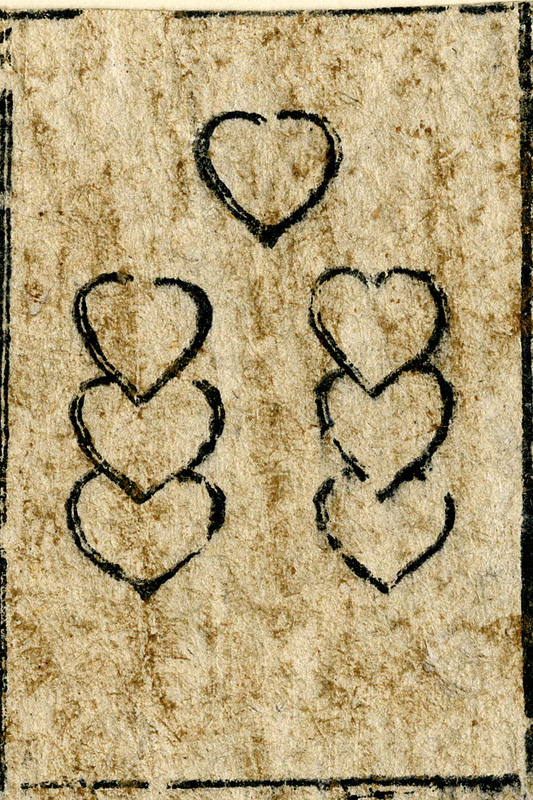 Since both sheets contain the ten of hearts, they do not form two parts of the same deck. 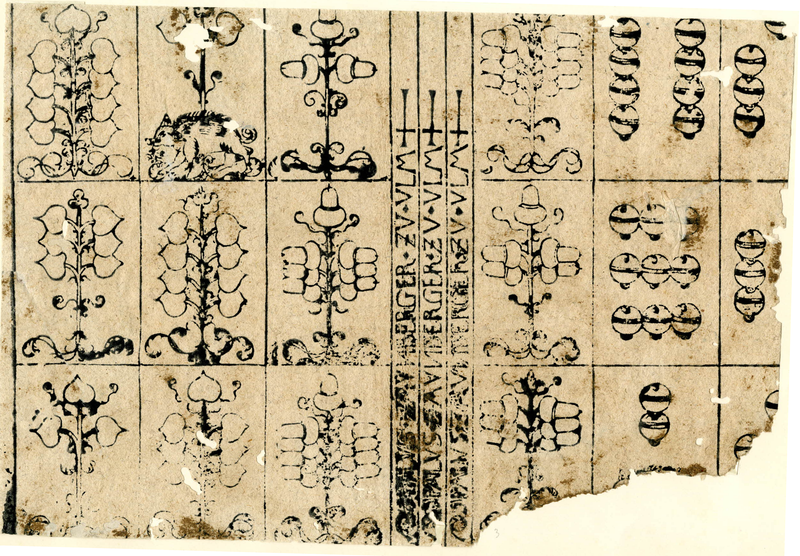 However, like the two decks of the elder Zaunberger, they are similar enough that they may be regarded as the same pattern. 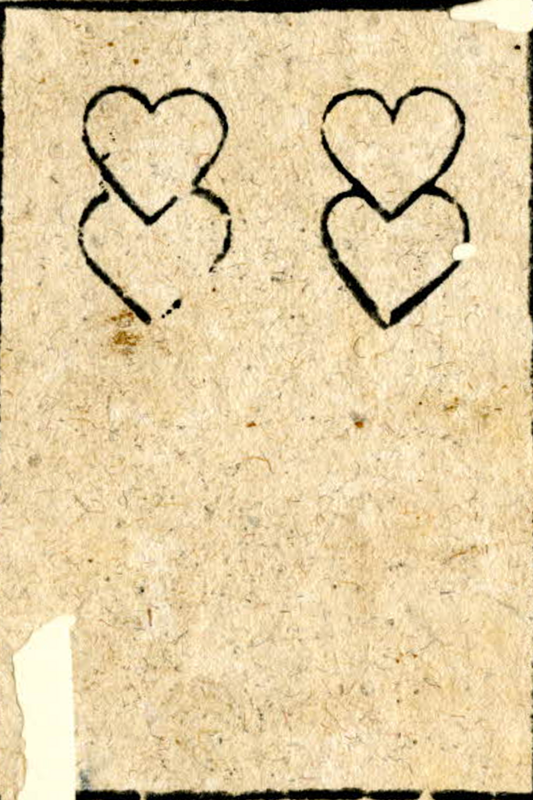 One minor detail that tie them together is the minute lettes on the left four of hearts of deck 1 and on the ten of acorns on deck 2. 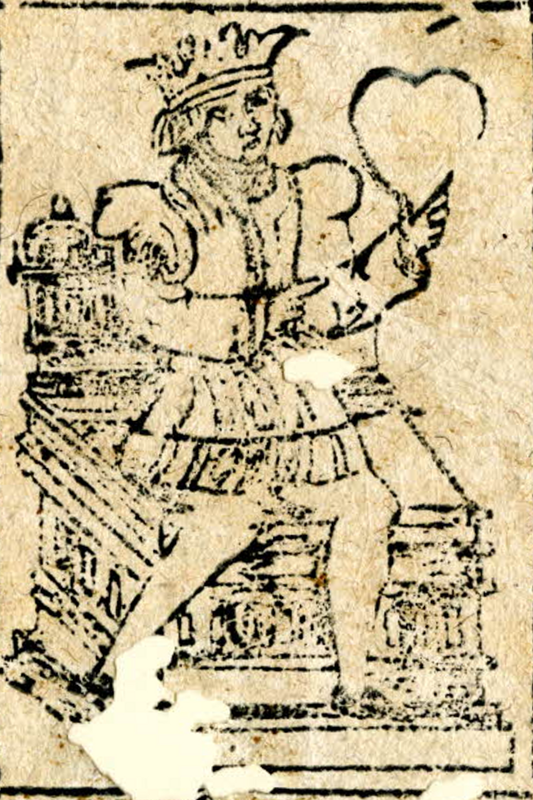 Genealogical records shows a person whose name was variously written Georg , Gerg , Jerg and Joerg Zaunberger, born 1572 as the oldest son of Paulus Zaunberger, and whose oldest son in turn (born 1595) was named after his grandfather. 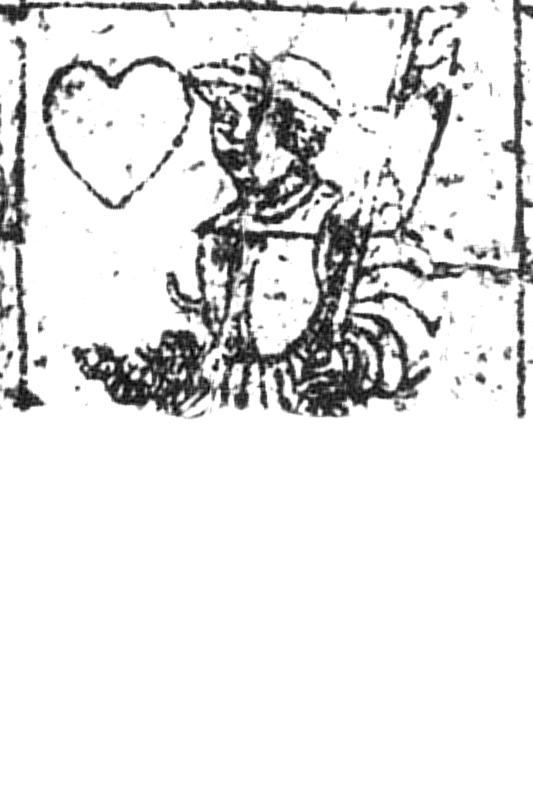 It seems that the older Paulus remarried in 1588 and had a daughter from this marriage as late as 1594. 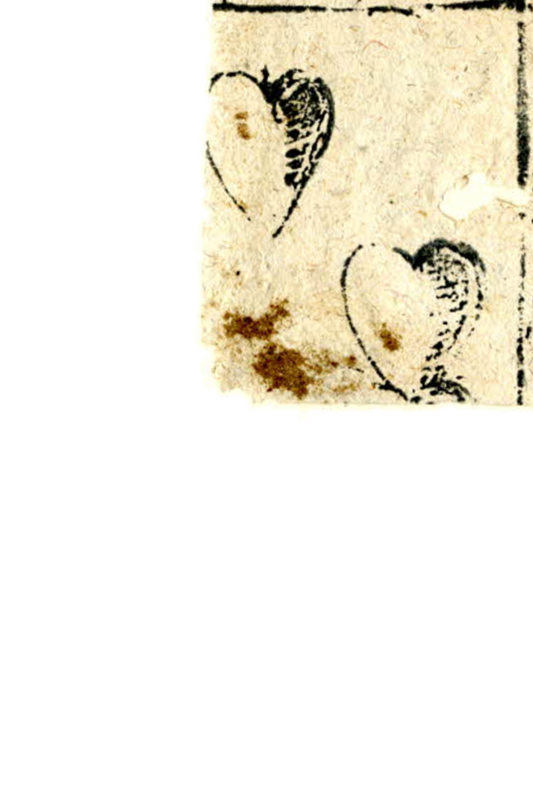 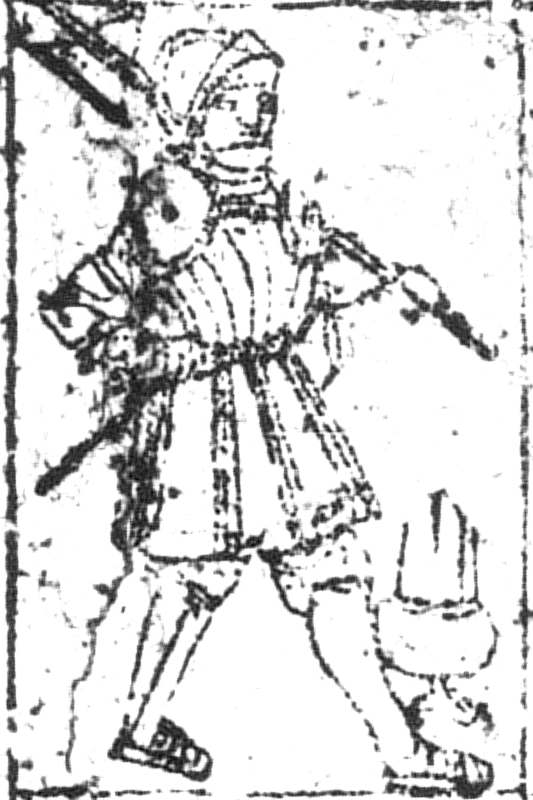 If these persons are indeed the card makers, which seems highly probable, the likelyhood is that they were active together in the same workshop around 1594. 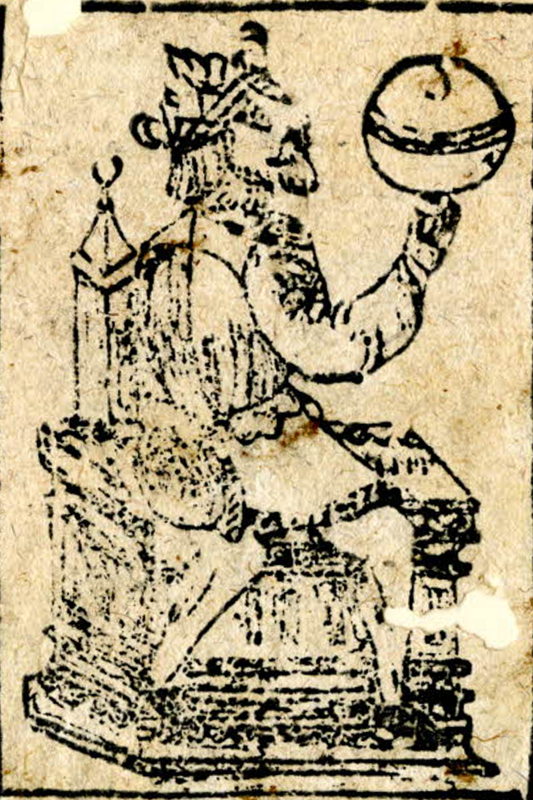 The name Ierg/​Jerg/​Jörg/​Joerg/​Georg/​Gerg Zaunberger could possibly match the monogram on Pa(u)lus’ deck, but only if the highly unlikely reading ITZ is accepted, and a lost middle name is assumed. 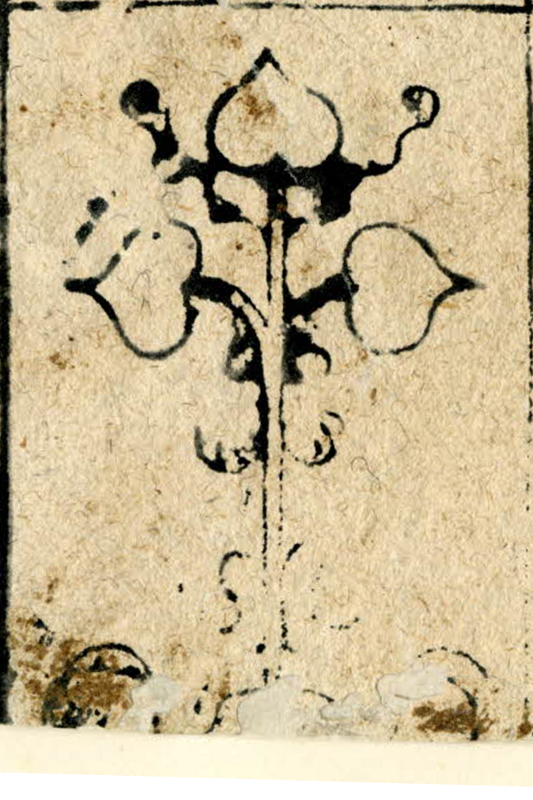 Deck 2 has a subtle feature shared with several early decks. 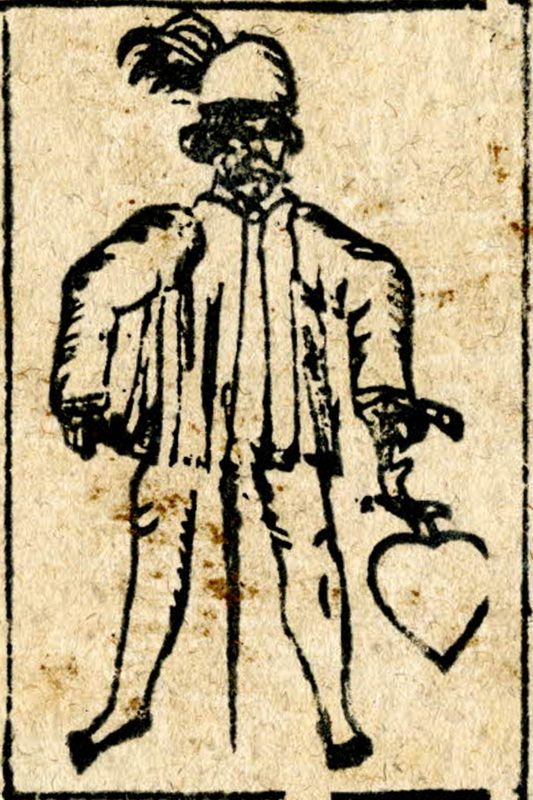 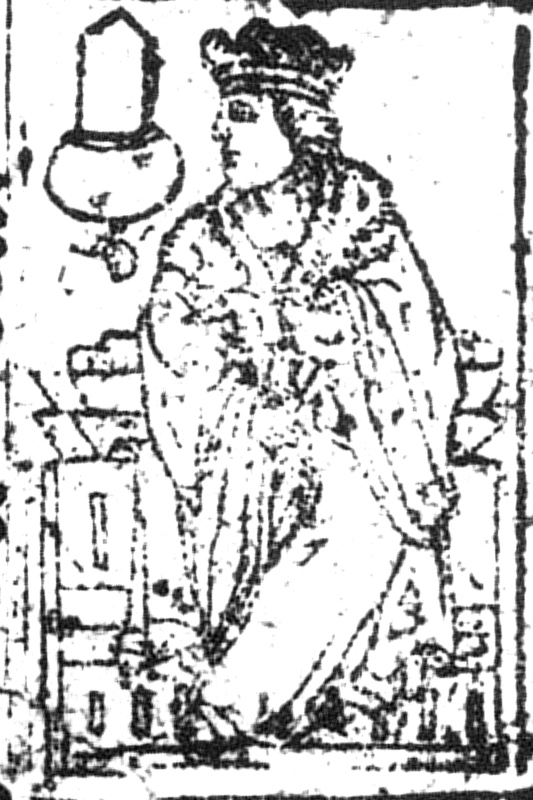 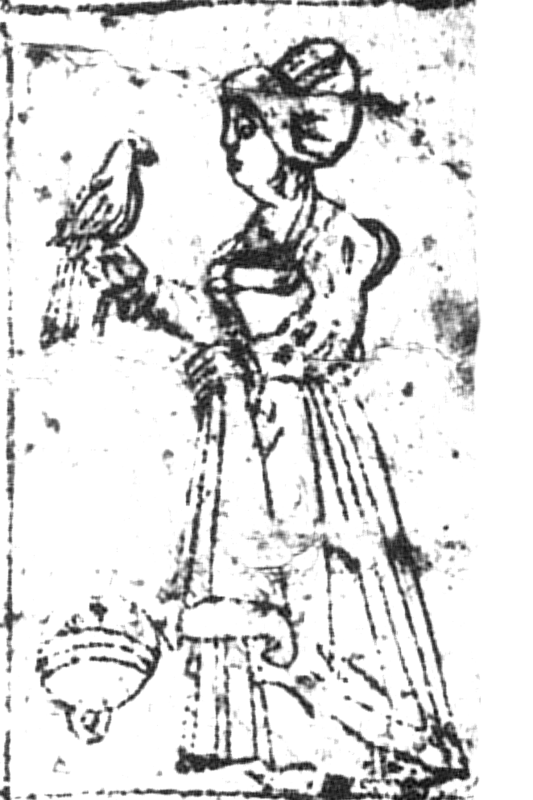 While most court cards are represented by male figures, the under-knaves of hearts and bells are female. 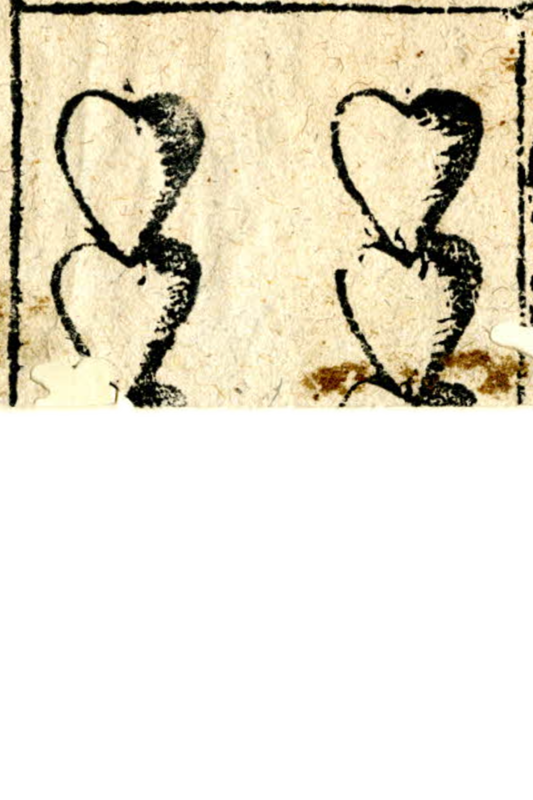 These two suits were ranked in reverse in many games of the period, meaning that lower pip cards beat higher. 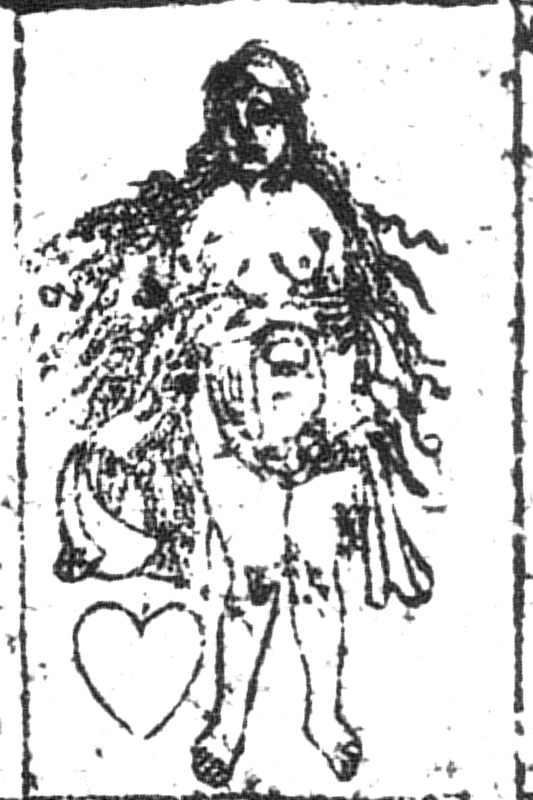 This distinction was sometimes expressed by various means, of which gender was one possibility.